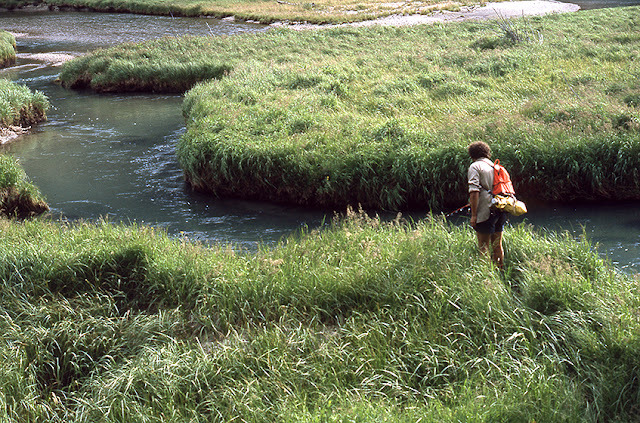 Wind River, #85: When we wake on the day of our hike out to Elkhart Park, it is cool, and clear with a light breeze blowing. These are perfect conditions to do a long hike, so the day starts well. We eat a full breakfast, stash some snacks and lunch items for easy access, drop the tent, and pack the packs. Shouldered up, they seem remarkably light, as they should, considering they were previously stuffed with 10-days of food, all of which we have now consumed. In retrospect of this summer, and the one that will follow, Vicki and I are probably in the best physical condition of our lives. We have been doing a lot of winter camping and skiing, and we backpack all through the summer months. Nonetheless, our destination today, Elkhart Park, is about 18-miles away as the trail twists and turns, and even at a good walking pace, it will be late afternoon, or twilight, before we hit the area in which we have parked our van. Our bodies warm up, and get into a walking rhythm, as we traverse the lengthy shore of Wall Lake, most of which is relatively flat. Then we arrive at our first descent, following the trail of waterfalls down to the Cook Lakes. The view is inspiring. The day remains clear and cool. The first mile or so is behind us, and Mike Knowlin, good restaurant food, and a real bed await us in Pinedale. Wind River, #84: The gods are kind to Vicki and me on our final evening at Wall Lake, as the storm we have been watching and listening to, never blows over us. After a dramatic light show (last two posts), lots of hail, rain, and thunder in the Pole Creek headwaters basin, the cell passes by, and the ridge above that basin re-emerges in the last light of the setting sun. It is a dazzling display of alpenglow, we both take as a good sign - a positive event on our last night here to send us off properly on what will be a very long walk out tomorrow. We are also excited by the idea that we will return here in less than two weeks, if in fact, we make the off-trail traverse from Island Lake that we discovered today. As the light fades, so do we, retiring early, and hoping for good weather the next morning. Our packs will be light, but 18+ miles is a long distance, and it would be made more difficult, if it were to storm. Wind River, #83: From our campsite at the far end of Wall Lake, Vicki and I are having our last dinner before we walk out the next day to Elkhart Park. We are excited by our discovery of an off-trail route between here and the Island Lake Basin, and are making plans to take advantage of it on our next backpack. In the meantime, somewhere to our north, a weather system is really cranked up, and we can hear the thunder. At the far end of our drainage, looming above the Pole Creek headwaters, a ridgeline I have been referring to as “the fortress” forms an impressive part of the view (last post, and also #77). Tonight, while we eat, it is playing hide-and-seek. The southern-most edge of the bad weather we can hear, has reached the ridge, and is blowing over, and raining upon, the headwaters. Sometimes the rain is so hard the entire wall disappears. It is interesting to us, that the storm does not extend to the sunlit wall directly in front of our camp, and does make for some stunning contrasts. While we watch, it dawns on both of us that the light on the rock face is the low angle of the sun, coming through the pass we ascended earlier in the day. We did find a stairway to heaven. Wind River, #82: The camp Vicki and I have established at Wall Lake is deep into the shade of the evening, but the sunlight and passing weather still adorn the high peaks surrounding us. Weather in the Wind Rivers can be very location specific, and tonight is going to be one of those events. When Vicki and I retreated from the high ridge of our day hike, we did so in part because we did not want be in an exposed place when incoming weather from the west arrived. By the time we are back in our camp, that weather is blowing through, but at the moment, it is not over us, but rather just the peaks at the far end of our basin. From camp, the cloud and light show is dramatic, as once again the “fortress” wall at the headwaters of Pole Creek (post #77) puts on another spectacular display. Wind River, #81: Our down-climb from the ridge that will link us off-trail to the Island Lake basin, is pretty effortless, and the incoming weather is slow to build up. By the time we arrive back at our Wall Lake campsite, the lake has passed into the shade of evening, and the weather threatens, but there is no rain at the moment. The day was hot, and the air stays warm, so we have a relaxing dinner at lakeside. For whatever reason for which we are both grateful, the mosquitoes in this basin are minimal, and we can get through our meals and hikes, without wearing head-nets. Both Vicki and I are excited by our “stairway-to-heaven” discovery, and eagerly await our opportunity to use our off-trail route, but for the time being, we chill in the twilight, expecting a LONG day tomorrow. We are going to walk out some 18-miles to Elkhart Park, and return to Pinedale for rest, a resupply, and to hook-up with our friend, Michale Knowlin. In 2-days, the three of us hope to hike back in, and camp, in the Titcomb Lakes basin. Wind River, #80: As I expected, the last section of our day hike/climb is the steepest, but it is not sheer granite. It consists of random snowfields, and some boulders with squishy, exposed terrain between them, most of it easily negotiated. Our last few steps carry us over a roll of granite at the top of the ridge, and before us, an entire basin filled with lakes appears. 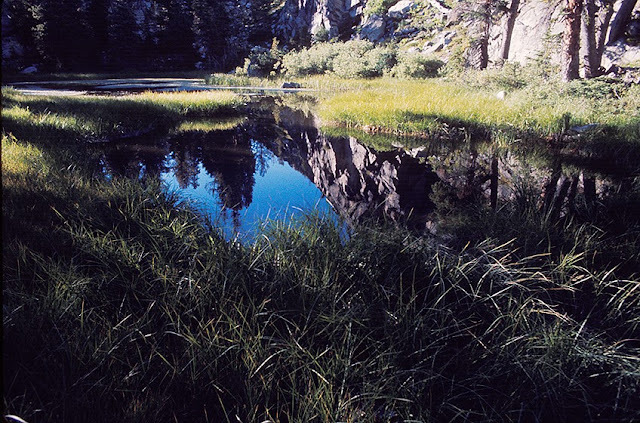 The surrounding landscape is rolling granite, boulders, and blooming meadows, none of it too extreme. This IS a navigable pass through to the Island Lake basin, which is about 1-mile to the right in this picture, AND there is very little up-to-go-down, since we are nearly the same elevation. Vicki and I have found a GREAT off-trail shortcut between Wall Lake basin and the Island Lake/Titcomb Lakes basin. Immediately I begin to rethink the plans that we have made when we meet our friend, Michael Knowlin. Vicki and I linger on the ridge, enjoying the view and having a leisurely lunch. By the time we finish, clouds can be seeing coming in from the West, and it would seem that we are going to have a typical afternoon build-up of weather, so we both agree to head back down from our exposed location. 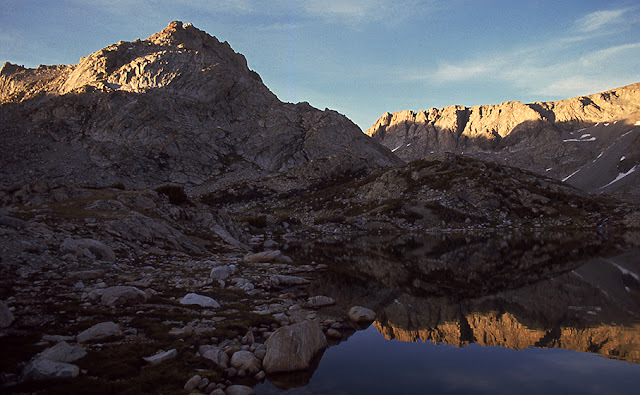 The down-climb is not difficult at all, and could easily be done with a backpack on, so I REALLY want to camp with Michael at Titcomb Lakes, as we planned, but after 5 days, when he walks out, I propose to Vicki we stay, and drop down to Wall Lake. Having now seen the route, she is on-board, so we amble slowly back to our present camp for an evening meal. Wind River, #79: When we arrive at the spot I noted from the day before, it does appear to be a “stairway-to-heaven.” It is a simple boulder field, interlaced with blooming terraces of dense wildflowers. It is beautiful just to walk through, but if it continues up, over, and into the smaller lakes in the Island Lake basin, it is an epic revelation. 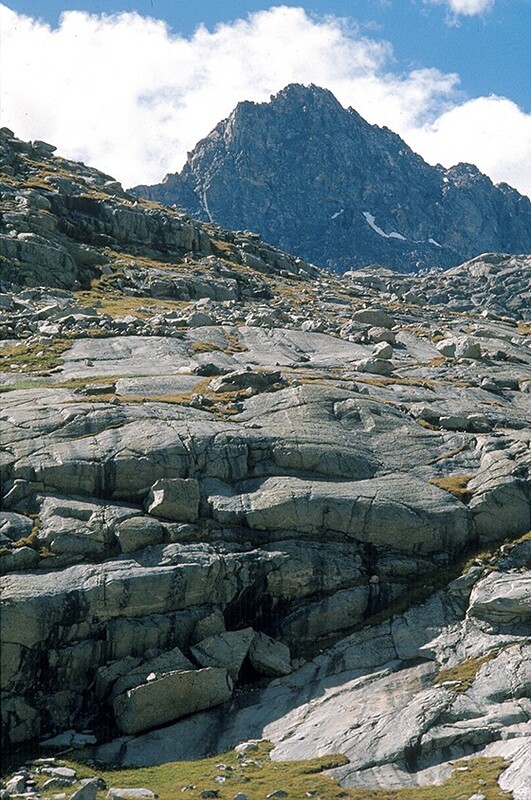 The climb is slow and steady, as we are ascending to a pass, but, as yet, we have not encountered any sheer granite. We make numerous stops to remove clothing layers, drink water, and have snacks,..also, just to look around. The wildflower bloom is breathtaking. We got an early start from our Wall Lake camp, so we near the top of the ridge around noon, and if there is to be a point that we cannot ascend, we are coming to it. If you look at this link, our route is clearly visible. At the very end of Wall Lake, you can see a band of greenery climbing up through the rocks to the west. It would seem we are ascending what might be a pass over a low ridge between Mount Lester and Harrower Peak. The greenery appears to extend all the way to the last small section of the ridge that sports several snowfields. What we don’t yet know is how steep this last section is, and can it be traversed. 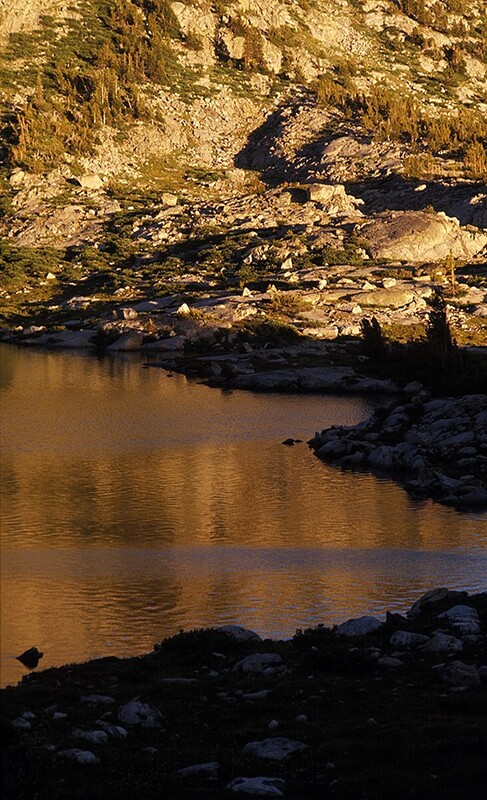 Wind River, #78: The next morning dawns warm and cloudless. 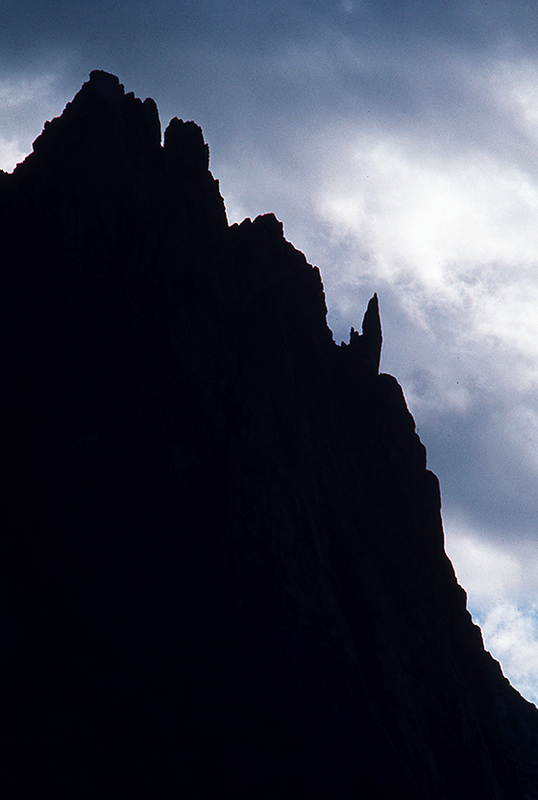 With no weather threatening, if there were ever a time to risk climbing higher, this is it. During dinner the night before, I told Vicki about what the topo maps appear to suggest, and I propose that we investigate if, in fact, this could be an off-trail way into Island Lake. From where we are camped at Wall Lake, the marked trail to Island Lake is arduous. 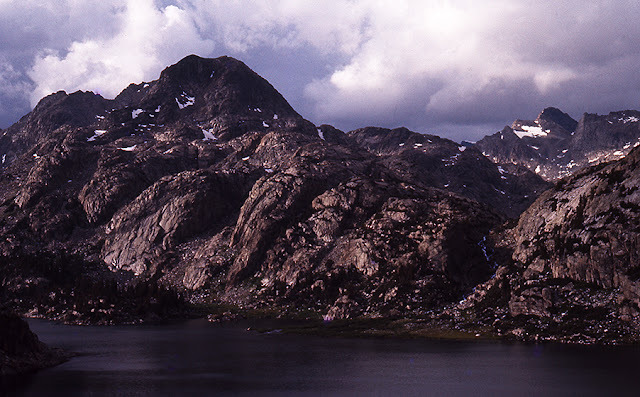 We would descend to the Cook Lakes, take the long walk around them, then climb up over 11,000ft.+ Lester Pass, descend to Seneca Lake, and then climb, once again, to reach Island. That is a STUNNING amount of up-to-go-down - thousands of feet of elevation gains and losses, pounding away at our knees and back. Were this “stairway to heaven” I think I have discovered, prove to be navigable, it would be a truly remarkable shortcut. Nonetheless, other trips in the Winds have taught me to be cautious of unexpectedly steep granite, so I am grateful today that we have no agenda, and we are simply going exploring with our daypacks. Once again, we begin by following Pole Creek back into the basin. Not only is it warm, it seems that EVERYTHING is blooming. The terraces and meadows are festooned with wildflowers, and I begin to have a VERY good feeling about what we are going to discover. 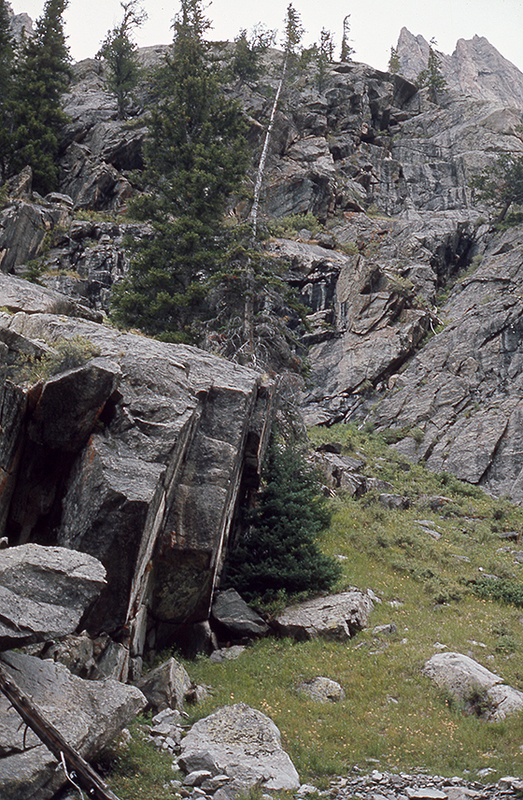 Wind River, #77: Having reached the headwaters of Pole Creek, Vicki Golden and I, spend a good part of the day just enjoying the remarkable granite world in which we have immersed ourselves. After a late lunch at the last small lake in the basin, we begin a slow walk back to our camp at Wall Lake, and as we wander, I regularly take out the topo map, to see if there is anything we are missing. On the east side of the basin, and somewhat above us is another fairly large lake, but Vicki and I agree that we are too tired to climb again, so we pass on that exploration. Close to the actual shore of Wall, and nearly “home,” I notice a very ascendable series of garden terraces that climb up the west side, and when I locate that terrain on my topo map, it does not seem too steep, except where it nears the dome of the ridge, after that, it appears we would find ourselves in basin of small lakes, and within easy walking distance to Island Lake. The evening is upon us, however, so I will discuss my discovery over dinner in camp. While we dine, the setting sun lights up Knife Point Mountain, and we enjoy reflecting on the fact that several hours earlier, we had lunch at the foot of this “fortress” wall. Wind River, #76: Continuing on our walk after a morning “bath," Vicki Golden and I are surprised by how deeply into the range the Wall Lake-Pole Creek Basin cuts, but we are enjoying the leisure of this day hike, because the terrain is stunningly rugged, and beautiful. We feel like we are walking in the garden of the gods,..and we are! Our progress toward the Pole Creek headwaters winds through unusual boulder fields, over-the-top displays of blooming meadows, and flowing water everywhere. Crystal clear pools, water slides, island rocks on which to ponder the world while snacking - as The Beatles said, “It Is All Too Much!” Our walk also rises steadily, however, and as we near the headwater lake from which Pole Creek is born, we encounter a good deal of snow, now hardened by the melt-freeze cycle of the emerging summer. 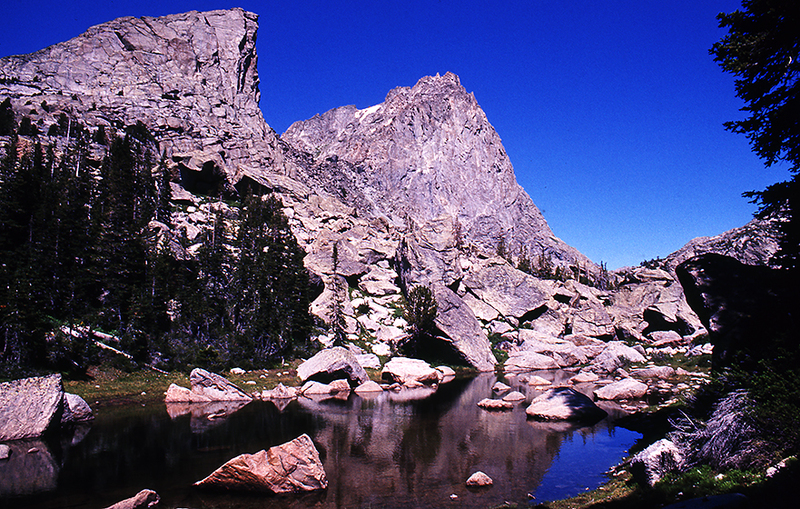 The basin ends with a series of small lakes surrounded by the impressive walls and summits of Harrower Peak (13, 057ft.) and Knife Point Mountain (13,007ft. ), and so we sit for a good while having lunch, and watching the light of day play tag with cloud shadows racing across the faces that surround us. Wind River, #75: As Vicki Golden and I walk ever deeper into the Wall Lake-Pole Creek basin headwaters, we have entered a gently ascending world of extravagantly blooming meadows, and flowing water. There are water slides, and waterfalls, little ponds, and then this, - a REALLY nice place to swim. As anyone who has ever swum in a high-mountain pool knows, the most important thing to determine before you jump in, is how to safely exit without being injured. When you jump into water this cold, there is A LOT of thrashing around and shouting that occurs, after which you flail yourself wildly to an exit point, where you hope to get out unscathed. Having a sand floor, and very visible, round boulders, this pool could not be more inviting. Moreover, at this elevation we do not even have many mosquitoes, so Vicki and I do a quick disrobe and take the plunge. As we would discover a little farther on in our hike, this water has come directly from melting snowfields, so it is probably about 35˙, and rest assured it was surprising to us. There is quite a bit of splashing and loud noise that comes from both of us, and I do not think either of us is actually in the water for more than a few seconds. Nonetheless, after warming in the sun, we agree it has been a good place to “bathe,” and now we should continue with our day. Wind River, #74: Fleecy clouds are blowing through our morning as Vicki Golden and I slowly wander from our campsite at Wall Lake, farther into the basin behind the lake, following Pole Creek to its headwater. 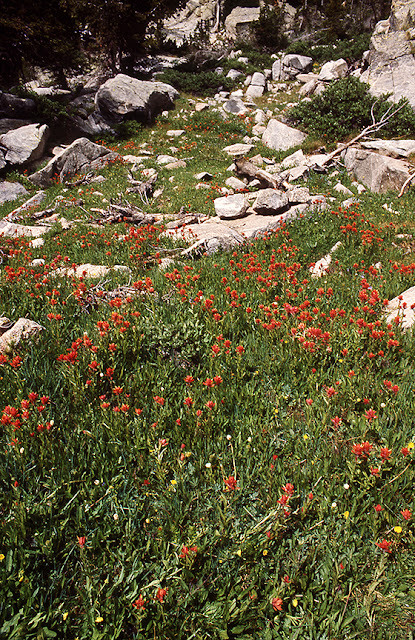 It is spring-summer at this elevation and the meadows are lush with grass, and blooming with flowers. The day is warm, the environment around us a kind of flowering paradise through which a sparkling creek runs, and making it all seemingly more secret, or magical, we are the only ones here. We are steadily rising as we progress, but it is not a climb, it is more like walking through a gently sloping garden. We stop frequently to take deep breaths, and drink it all in. When we sit in silence all you can hear are the sounds of wind and water. From my experience last summer, I knew I wanted to return to the Winds, but I had NO idea how much more there was to discover. Now I am beginning to realize the vastness of this huge range, and how unique every individual lake-river system, every basin, and every pass really is. Wind River, #73: The outlet end of Wall Lake is mostly granite and few gardens, and there is too much exposure, so Vicki, Belle, and I traverse the shoreline, looking for some place that offers a little more protection. 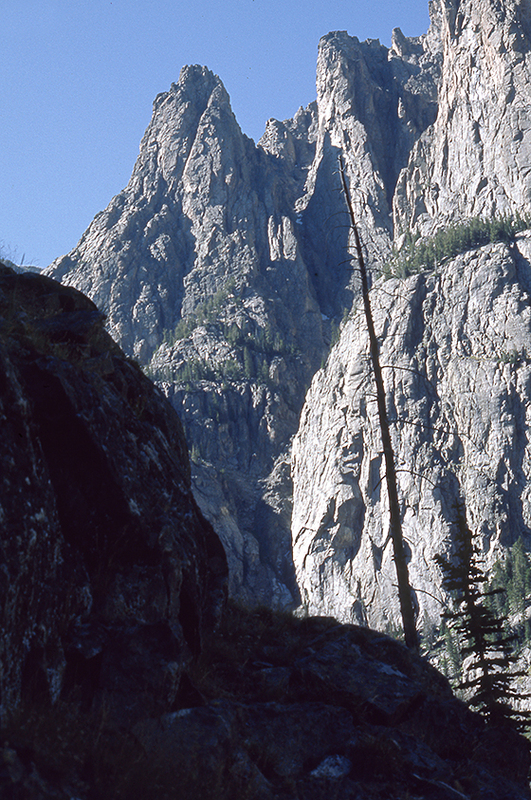 At the other end of Wall, the basin becomes a bouldered terrain, speckled with some beautiful, flowering gardens through which Pole Creek is flowing. We find a nice place to pitch in amongst some very large rocks, and settle for the night with a good dinner. The next day dawns breezy, and although the sky is swimming with cloud layers, we can tell it is not going to storm on us, so we eat a casual breakfast, stock our daypacks, and begin a slow wander, ever deeper into the basin. We finally have had the good sense to acquire complete topographic maps for the entire area, so we know we are in the Pole Creek headwaters, surrounded by some impressive spires and summit walls, and we spend a good deal of the day just walking to the far end of the basin where the creek begins. Wind River, #71: Vicki Golden and I spend a lot of time on the road during the winter season, shooting stories for POWDER magazine, and expanding my personal B&W winter work. On many of these adventures, we hook-up with our DFC&FC colleagues in Sun Valley, ID, and undertake some serious winter backcountry skiing and camping. When we are in LA, we spend A LOT of time on roller skates, and we always take our skates with us when I go to Manhattan (NY) seeking editors and galleries, so we skate many epic days and nights in Gotham with our friend, Doug Metro. As a result, she and I are very fit, and when summer returns, I am eager to take her backpacking in the Wind Rivers, knowing what I know now, from my previous summer’s experience in the range with Chris and Cathy. My dog, Belle Star, is certainly up for this as well, and so we plan to spend the entire summer based out of Pinedale, attempting many different hikes. My adventure the previous year at the Cook Lakes was SO rewarding and beautiful, I wanted to return there first, but not to repeat what I had already done. Walking in from Elkhart Park to the Pole Creek Lakes is a long first day, but a perfect warm-up for Vicki, as she has not seen these trails before. It is a pleasant day, without too much heat, and we make a nice lake camp by late afternoon. Unlike this stop last year, we have not been snowed upon on the walk in, AND we are only here one night. We are moving the next day to Wall Lake, above the Cook Lakes. Wind River, #70: Many miles down the trail from Island Lake, the light is fading and so is my strength. The very long day hike is now catching up with us, and Belle and I are quite happy to see Seneca Lake, and our campsite. We both eat a little more food, and then zone completely out. In the morning, we enjoy a slow breakfast and await Chris and Cathy, who are breaking their camp at Island Lake. They will join me here and we will walk out together, all the way to Elkhart Park. This backpack is to be the last of this season, and we will all return to LA once we are out. It is clear to me, however, that I have a growing body of work, and I am just beginning to understand the Wind Rivers, so there is MUCH more to explore. I intend to come back next summer, so I call my friend with whom I camped this year, Mike Nowlin, and ask him if he wants to join me, which he does. In fact, he promises to bring an inflatable backpack raft, so he can float out into the big lakes and catch “monster” fish. That should be amusing! Wind River, #69: Chris, Cathy, Belle (my dog), and I, are working on the end of 20+ miles day hike. An AMAZING day!!! It is now late, however, and we are headed down, out of the Titcomb Lakes basin, and back to Island Lake, where Chris and Cathy have their camp. We walk into the evening, enjoying a long, slow sunset. Above, the waning light sets Jackson Peak, Fremont Peak, and Sacajawea aglow. These are some of the tallest summits in the range, and walking beneath their towering walls all day has been an incredible experience. Arriving at Chris and Cathy’s camp, they suggest I stay with them and bivouac, as Belle and I are still miles from our camp at Seneca Lake, well below us. I still feel great, however, and opt to do some food refuel, but insist I will move on. We have a nice, heartening dinner together. Belle gets a rest in the meadow grass. Then, before darkness makes the trail dangerous, she and I head for Seneca, and home. 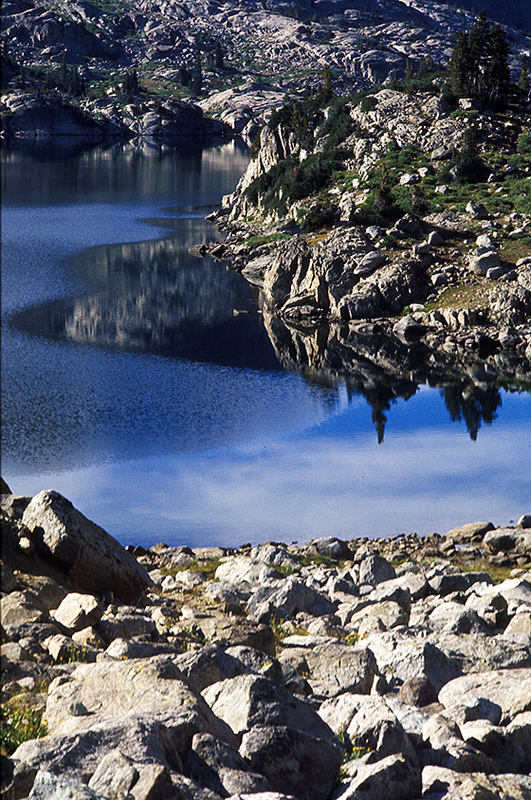 Wind River, #68: Mistake Lake is long, skinny, and completely hidden from any view were you below it in the Titcomb Lakes Basin. We would not know it was here if I had not seen it this morning when studying the topo map on our hike in. The lake is ice-cold, a completely different color of blue from Titcomb, and bordered by snow patches along a good part of its shoreline. Because we are now well above 11,000ft., the crazy gusting wind that has been with us all day, is even crazier. Belle’s ears are in their “pin-backed” mode. We all have on our hooded rain panchos to to give us some protection from the chill, and when we stop to ponder, we shield behind rocks. 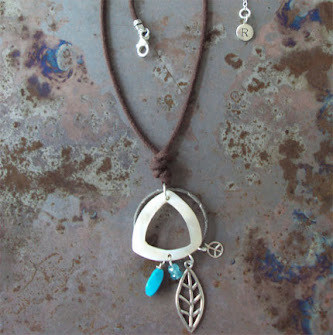 This is a nice one! At the end of our shoreline traverse, we rise up the dome that divides us from the Titcomb Basin, and pick a steep, but unchallenging decent through boulders and meadows, back down to the Titcomb Basin. From there, a well established trail takes us back to Island Lake, still several miles away, where we will arrive at Chris and Cathy’s camp. Wind River, #67: If you look at the last post, you will see a meadow covered ridge between Mistake Lake and the Titcomb Lakes Basin. Chris, Cathy, Belle, and I have now crossed over to it and are standing upon it, looking down at the Titcomb Lakes. It has been wildly windy all day, and that has only been exacerbated by our climb higher. We are currently standing behind some boulder protection, which I need to hold the camera steady in this shot, I am being so blown about. You can see the silver sheen of the wind trails here, as they rip across the surface of Titcomb. It is an eye-dazzling afternoon, but the wind chill is relentless and taking a toll. We need to keep moving, get back to the first camp, and have some warm food. 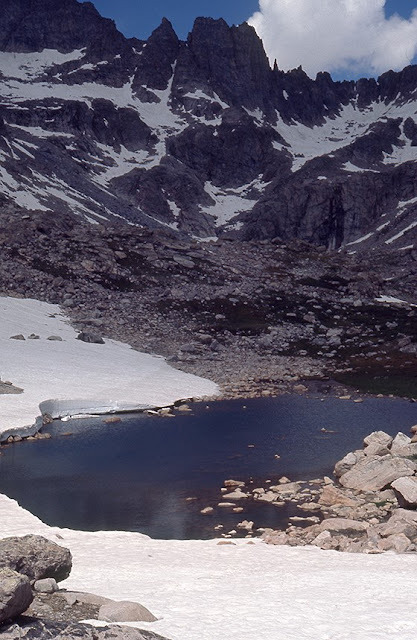 We all feel relieved at the moment as well, because from here we can see that there is a safe way to descend from Mistake Lake, back into the Titcomb Basin. Wind River, #66: Chris, Cathy, Belle, and I are having an epic day that covers MANY miles of hiking. 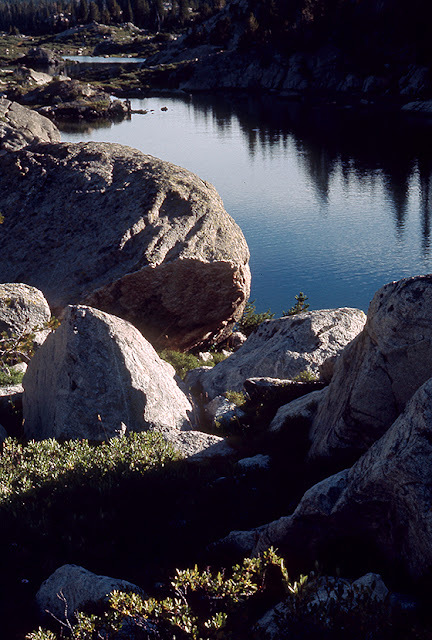 At the end of the Titcomb Lakes basin, we enter a world of rock, water, and strange erratics (posts #64-65). We have also been steadily rising as we traversed into the rocky basin, so our new position puts above the Titcomb Lakes. It is well past midday and we are all a LONG way from home, so we decide to start back, but rather than retrace our steps, I suggest we continue our rising traverse, and find Mistake Lake, which I saw was above us on the topo as we walked in. Chris and Cathy agree, and we begin a slow, rising ascent through boulders and gently sloping meadows. At this point you can see what our gradual climb reveals - the pale blue lakes on the right are Titcomb; the skinny, deep blue lake on the left is the relatively hidden, Mistake Lake. We are walking in the direction of this view, and our camps are still many miles away. 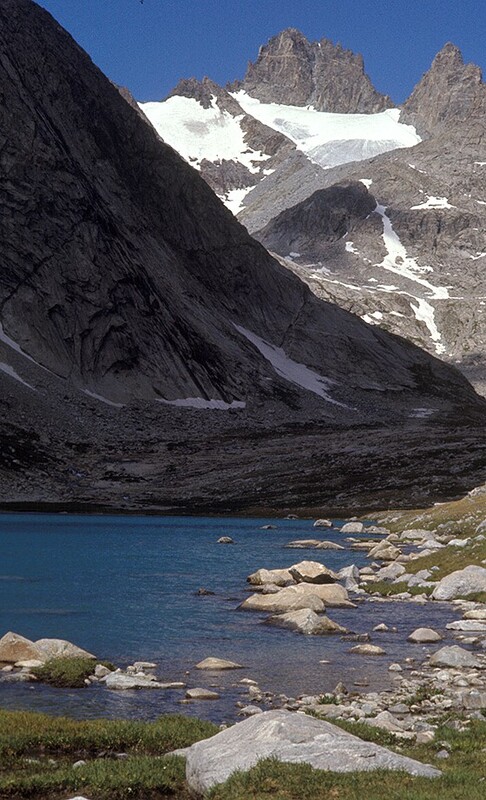 Now that we are here, we will walk the shoreline of the lake, then descend down the wall (we hope) back into the Titcomb basin. 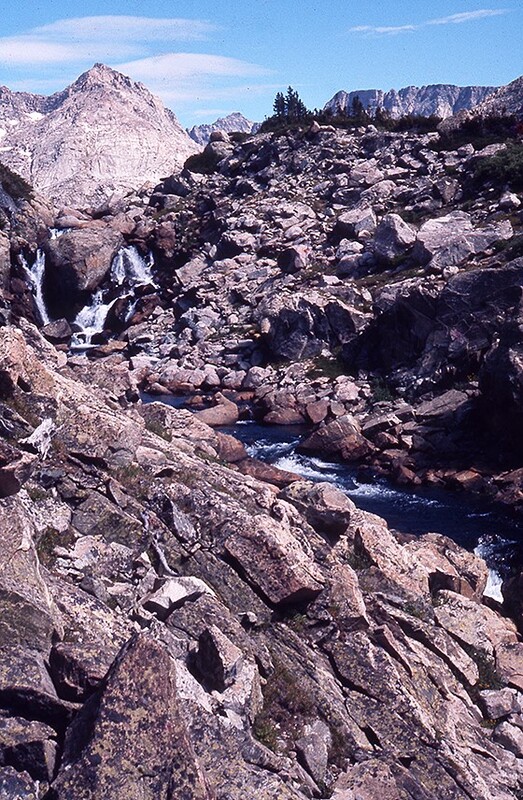 Wind River, #65: After some time spent wandering through the rocky valley at the end of the Titcomb Lakes, Chris, Cathy, Belle, and I turn back towards our camps at the lakes well below us. Although our walk along the lakeshore coming in seemed relatively flat, it actually was rising ever so gradually as moved along. Now, as we reverse our POV, we are looking DOWN at the Titcomb Lakes, so I suggest that on the way back we stay close to the eastern summit walls, rather than the lakeshore. I feel we should traverse into the basin holding the long, thin, very high elevation, Mistake Lake, which I saw on the topo when we walked in this morning. 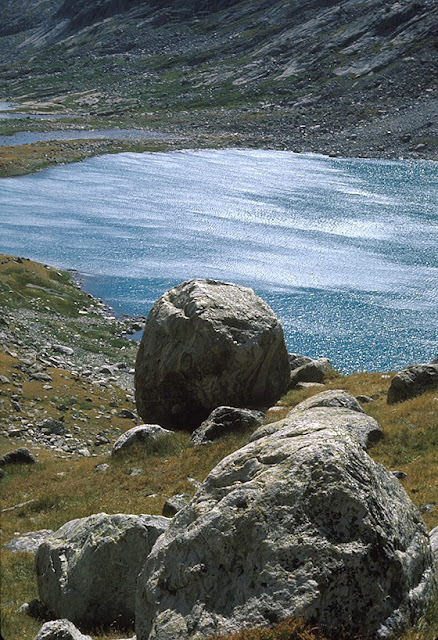 Even though we have hiked as far as we have, after snacks and rest, we all seem to have recovered enough, that we agree to visit Mistake Lake in our retreat. We do need to gradually ascend through some meadows and open granite as we walk back, but our stroll is endlessly entertaining, surrounded as we are by raging peaks, and sculptural erratics that I found (above), and those spires and towers in the background belong to Sacajawea, at 13,575ft., it is the eight tallest peak in the state, and the wall we are looking up is Yosemite-esque to say the least. 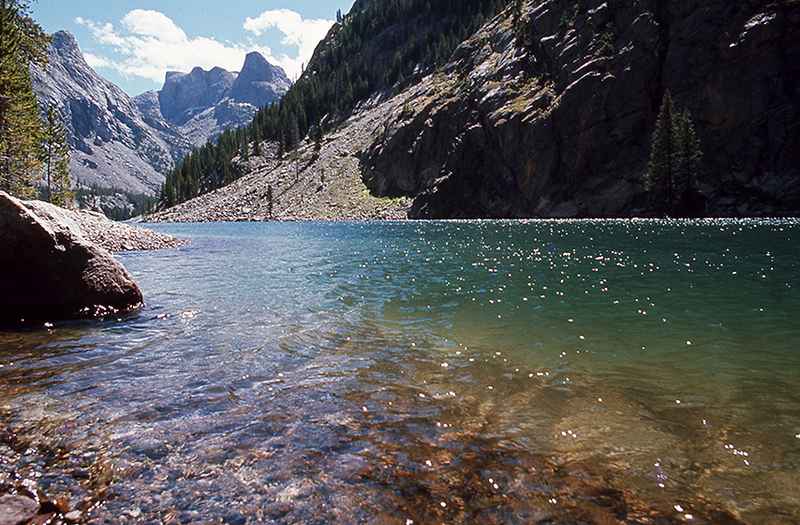 Wind River, #64: There are many curiosities in the rock-strewn valley past the end of the last Titcomb Lake. The flowering meadows have all but disappeared, and in their place stand erratic boulders, and places where the slab granite has been fractured so perfectly, it appears to be hand-hewn. Belle and I have wandered off in our own direction when we come to this - a place where the river is wide, shallow, and flowing through rock pools. 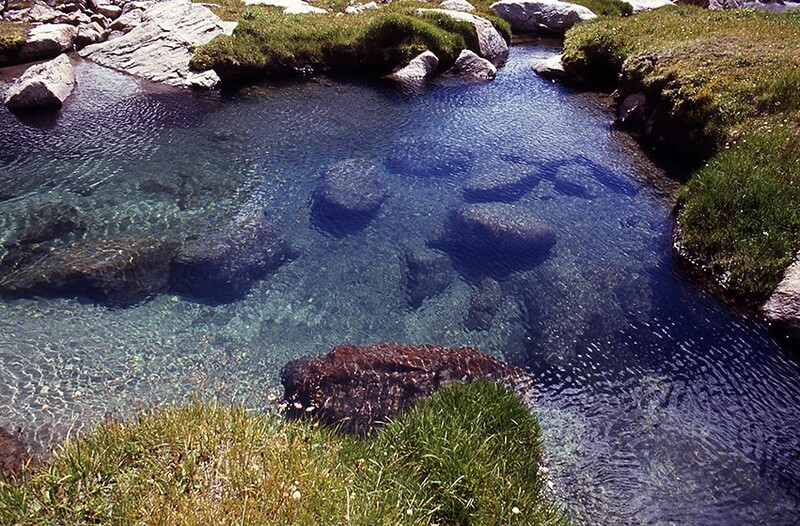 These are not typical “wild” pools, however, as they are more like manufactured ones, some are so perfectly cut. 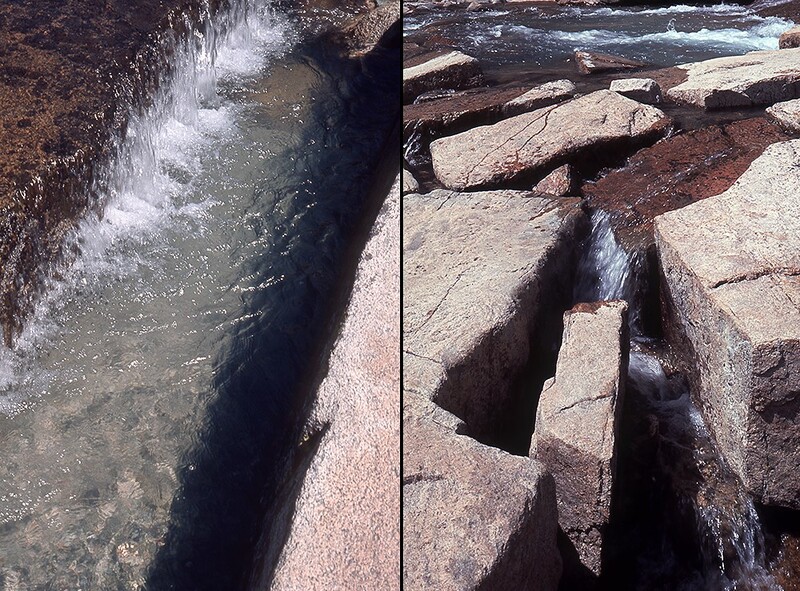 The fracturing of the granite all about us is sheer and precise - straight lines and AMAZING right angles! Then, Belle finds a perfect bathtub (left) and, of course, jumps in. The amazing rock “pool” is so tempting, I nearly join here, but decide against it as I would easily get hypothermic in the cold water, and then trying to dry of in this wind. Belle is NOT having that problem - LOL! Wind River, #63: After a lengthy walk through meadows and around odd, random boulder erratics, Chris, Cathy, and I finally reach the end of the Titcomb Lakes, and we are now deeply into a basin encircled on three sides by some of the tallest peaks in the state of Wyoming. In our passage to this point, we have been walking on exposed granite, or through flowering meadows. Now here, that changes. We have now entered a word of rock and water. There is very little growth showing anywhere. The summits tower above us, and the wind comes in howling gusts,..and I mean HOWLING! It is past midday, and we are a long way from Chris and Cathy’s camp at Island Lake, and Belle and I are MUCH father away from our pitch at Seneca lake, in fact, about 12 miles. For a while we rest and snack, trying to gauge our strength, and the effects of the unrelenting bluster of the weather. The light play is quite a show, and after a bit of sitting around in the warmth of the sun, we all get up and just begin to wander through the stoney terrain. Wind River, #62: As Chris, Cathy, Belle, and I walk around the upper Titcomb Lakes, we pass at the foot of some of the tallest mountains in the state. Although we are not “climbing,” as we move further towards the end of the basin, we ARE rising gradually. The lakes are shades of shimmering blue, depending on the wind, and the alpine gardens are abloom with flowers and boulder erratics. As we approach the end of the second large lake, the world is very “stoney.” On our right are the jagged spires and summit of 13,575ft. 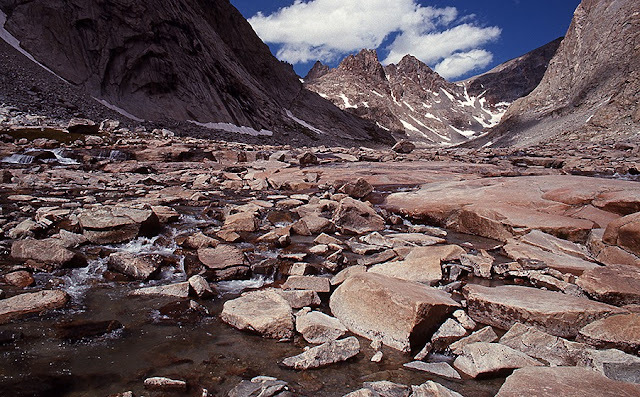 Mount Sacagawea, and ahead, a valley with hundreds of erratics, leads back into an even rockier basin at the foot of 13,502ft. 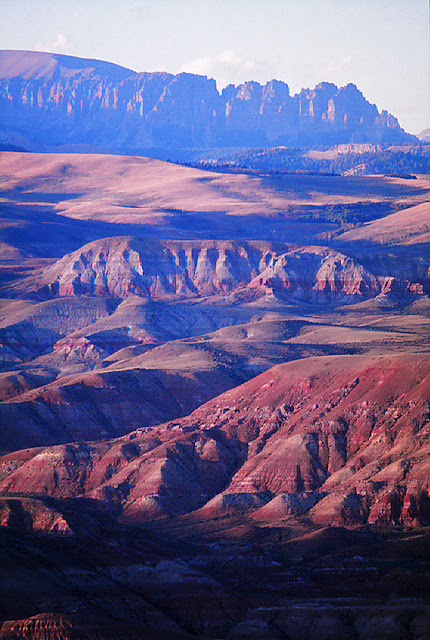 Mount Woodrow Wilson (above). The blustery weather has driven clouds across this basin and it’s surrounding peaks all morning long, and the play of light is amazing. Pondering how much farther we will walk, we stop here for some lunch, Belle goes for a swim, and a good time is being had by all. We sense we are being allowed to play in the “garden of the gods." 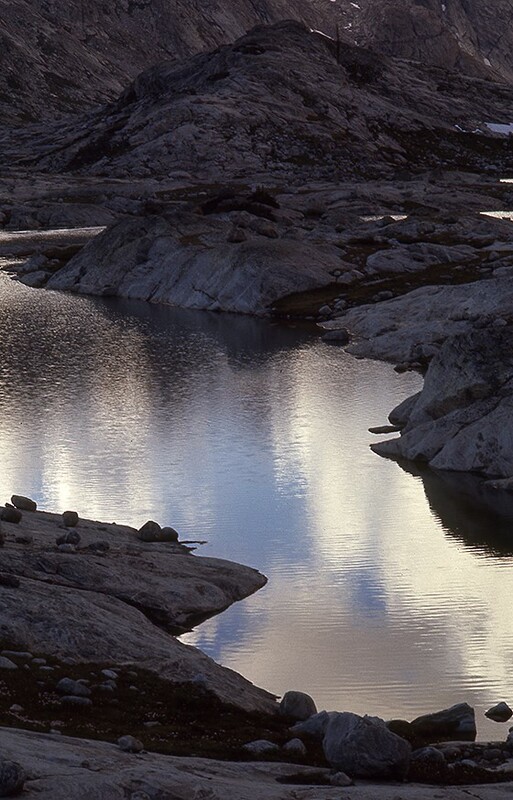 Wind River, #61: Having found my friends, Chris and Cathy, at their Island Lake campsite very early in the morning, we agree that we will spend the very nice day we have awakening, by day-hiking in the Titcomb Lakes Basin further UP the trail. It is windy, but without weather, and it blows evermore as the trail climbs. By the time we reach the first of the Titcomb Lakes, it is a stunning view, punctuated by howling gusts. 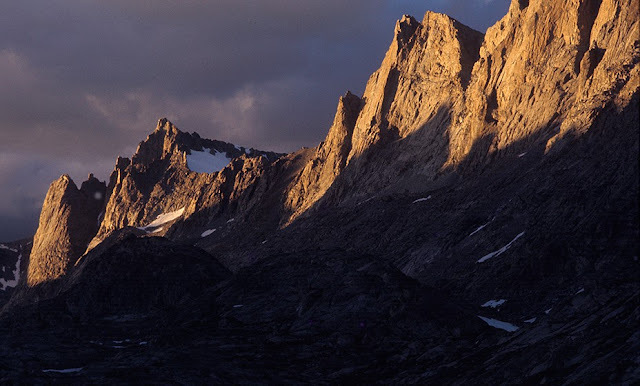 We have full-rig gear with us, so we are fine, and the basin is dramatically surrounded by some of the tallest summits in the state, that are now dappled by the shadows of clouds racing by. 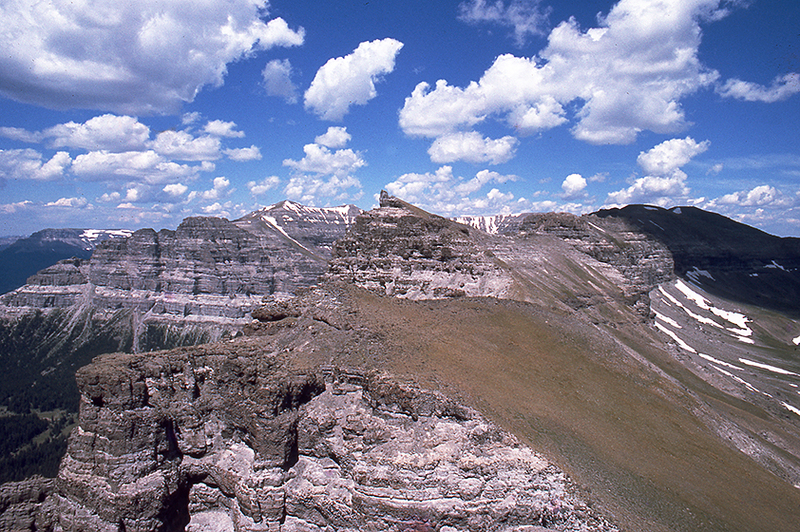 We are “trippin’.” When we arrive at the first of the two largest lakes, Jackson Peak, the eighth tallest in the state, 13,523ft. of VERY SHEER granite looms above us to the right. Next, just ahead all, 13,751ft. 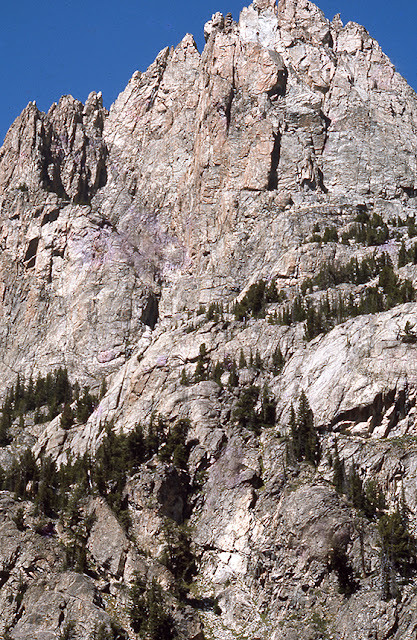 of Fremont Peak juts into the sky, third tallest in the state. These lakes are at 11,000ft. AND they are miles long. About halfway around the first large lake, we stop for snacks, water, and some relief from the wind, so I pull out my topo map for a look at our surroundings. Surprise! Surprise! 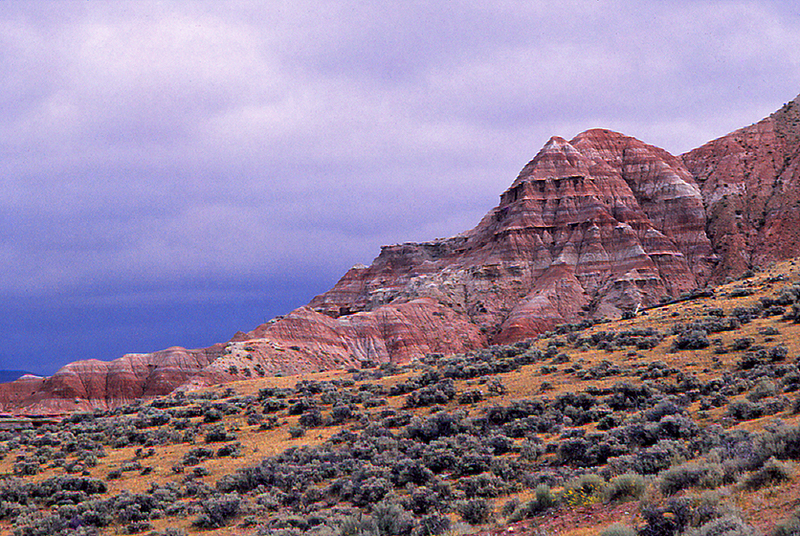 The summit above is Fremont Peak. The map shows us that there is a long skinny lake called Mistake, up there somewhere. Are you kidding me! Look how smooth that granite is. Wind River, #60: Because I was supposed to meet them yesterday, I am worried that my friends, Chris and Cathy, are wondering where I am, so Belle and I get started early from Seneca Lake. There is a considerable UP to where they are, Island Lake, but we arrive before most campers are stirring. The lake is huge, and high, and VERY beautiful, but in the scale of it, not all campsites are that visible, so I wander the trail slowly, scanning for my friends. I should have known that Belle would find them for me. Belle NEVER runs at other campers or their campsites, as she has been taught that is unwelcome, BUT she atypically bounds off the trail in-between large boulders, to a campsite where Chris and Cathy are having breakfast. We are all relieved to see each other, and Belle is wildly excited. I tell them the tale of my delay, to which I learn they can relate, because it took them a day longer to get here than they had planned, as well - Wind River trails have A LOT of “up-to-go-downs” in them, and it is exhausting at high altitude. We share some further food, and discuss the day. It is very windy, but radiant with clouds scudding over the peaks, and OMG! are there peaks! 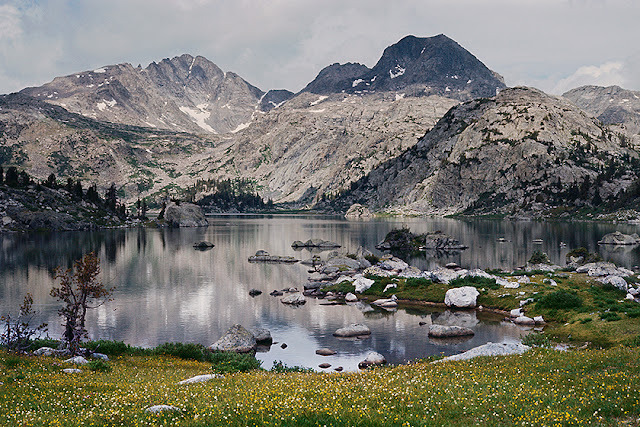 Interestingly, we all feel GREAT, exhilarated, and adjusted to the altitude, so we decide to go further up, into the Titcomb Lakes Basin and day-hike there, at the foot of some of the tallest peaks in the entire state of Wyoming. When the climbing trail finally flattens out, and we can see the basin for the first time, and it is breathtaking. The summits and big walls form a DEEP U-shaped valley, that has a string of large lakes, and alpine meadows, but no trees. What is lacking in trees, however, is made up for in glacial erratics. They are EVERYWHERE! Wind River, #59: At my Seneca Lake camp, the morning comes with some hazy skies, but so far weather does not seem threatening. I rise early and eat. I want to get moving up the trail to Island Lake, and find my friends, Chris and Cathy, so they do not get into a panic because I am a day late in my promised arrival. When we planned this trip, none of us knew exactly what we were getting into, and given my bad judgement on our previous backpack into Clear Lake (posts #11-37), they were very concerned that I would be “solo” for three days before we would connect. Now, I knew they would be worried. Given the oppressive heat of the previous day, this morning was clear, but cool, and a refreshing breeze was rising. Rather than move my Seneca camp up, I decided to leave it standing, and just go with a daypack, so I could travel light and fast. 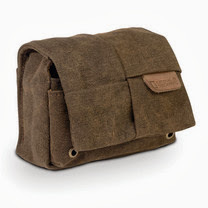 My meals and sleep greatly helped my recovery, and the light pack sets me free. I feel amazingly strong and unburdened, so Belle and I surmount the Island Lake trail (1,500ft. or so) rather quickly, giving us our first view of Island Lake before most of the campers are awake. 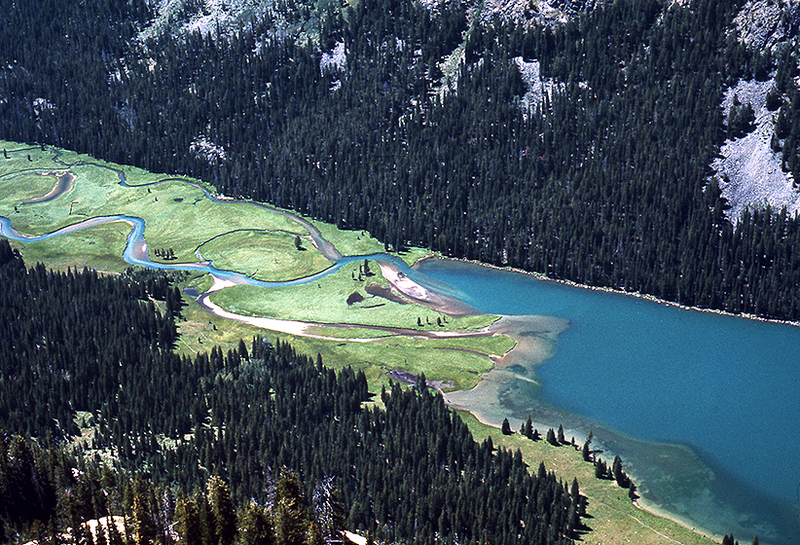 In this picture, Island Lake is in the foreground. Beneath the rugged background summits, which are some of the tallest peaks in the Wind River range, lies Titcomb Lakes Basin, and if I read my topo map correctly, there is a lake there that is almost 7-miles long. What! No matter, the job at hand is to find my friends, and that may not be easy given the scale. 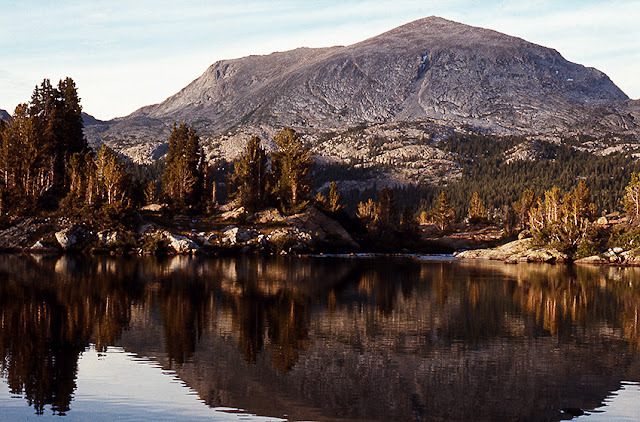 Island Lake is one of the most popular camping destinations in the range, and there are dozens of camps around the lake, but CAN THEY BE SEEN? Everything seems so small in this vast alpine landscape. For example, have you noticed the bright blue tent on the small rock dome, near the center of this picture? Where are all the other camps? Where are my friends? Their tent is green! 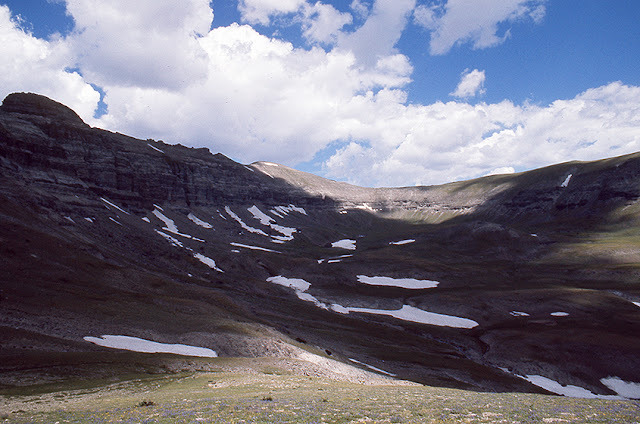 Wind River, #58: Belle and I have crossed over Lester Pass and descended to Seneca Lake in the heat of a very clear day. It is mid-afternoon when we reach the lakeshore, and we are exhausted. Belle has zoned-out on meadow grass, and I have come to the realization that I am too tired to climb the trail into the Island Lake basin where my friends await my arrival. Resigned to making that hike the next morning, I set up a camp, crawl inside my tent, and like my dog, pass out cold. When I awake, the evening has begun, and Belle wants to be fed. The good news, Seneca Lake has trout. The bad news, my friends expected to see me today, and I know they will be worried that I do not show up. I reason that they will come looking for me in the morning, so my Seneca campsite is close enough to the trail, that I will see them if they come. This day has been clear and hot, but now the cloudless skies are giving way to some amazing alpenglow, and it is cooling down. I catch several trout which makes Belle VERY happy, we have great dinner, and we watch an amazing evening light show, before retiring once again. I need to find Chris and Cathy as quickly as possible the next morning so they do not get into a panic about me having gone missing. Wind River, #57: When Belle and I awake the next morning at our camp at Cook Lake, the day looks like it is going to be clear and hot. That is good for the hike we must do, because we have A LOT of work ahead of us. From Cook Lake, we must go up and over Lester Pass (11,060ft. ), descending to Seneca Lake, and then we must go back up into the basin that holds Island Lake, because that is where my friends Chris and Cathy are camped, and they expect to see us tonight based on our plans. Having a crystal clear morning means I do not have to be worried about being stormed upon in a high pass, but unfortunately, it is going to be HOT! Recognizing this, we eat quickly, break camp, shoulder our packs, and head up the trail. UP is the word! Belle and I have about 2,000ft of trail climb to reach the summit, and every 1/2-hour the temperature goes up another degree. The weight of my solo pack slowly wears me down, and both us us have to drink water constantly. I am sweating so much, I am also taking salt tabs. The view at the top is stunning, and I can see the basin I hope to reach by days end, but the line between me and there is VERY indirect. I must now descend about 2,500ft. to Seneca Lake, and then begin climbing once again to get to Island Lake. At first I think my summit rest has renewed my strength, but as I descend, I find myself stumbling and struggling under my pack weight. When we finally reach Seneca and shed our packs, Belle flops to the ground in a meadow and zones out immediately. Then, as I sit taking in our new location, I realize I am also toast, and there is NO WAY I am putting the pack on again, and going back up a 1,500ft. trail. It is mid-afternnon, and we are here for the night. Wind River, #56: Back in camp, eating a good meal (trout), and watching the end of the evening, Belle and I will retire early because tomorrow we have to climb Lester Pass (11,060ft. ), en route to meeting my friends Chris and Cathy that await us at Island Lake. My Cook Lake experience has not been without its learning curve, but having survived, I ponder what a remarkable location this is. Cook Lake is BEAUTIFUL, and my brief visit to Wall Lake today, revealed an even more spectacular basin, literally surround by a fortress of peaks. I know at some point, I must return and camp “up there.” In this final shot from my Cook Lake campsite, I am looking directly into the Wall Lake basin. You can see the river and waterfalls that Belle and I had to work our way around earlier in the day, quite clearly. 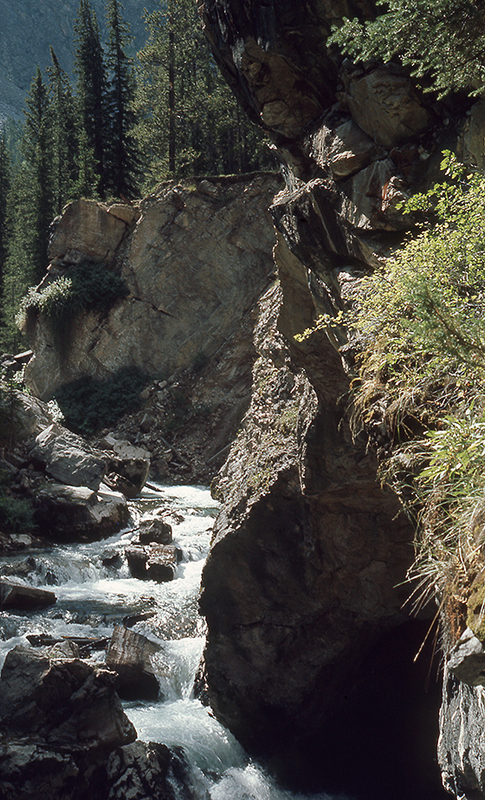 The established trail runs through the boulder strewn ledge on the right side of the river, and levels off where the shadow begins. It may seem small here, but in actuality, the basin is large, and Wall Lake is about the size of Cook. Remarkably to me, the dramatic summit you see in the distance is not even part of the Wall basin. That is Harrower Peak, and it is much farther away, but from this angle, the 13,057ft. summit is revealed. You cannot see it when you are in the Wall Basin. 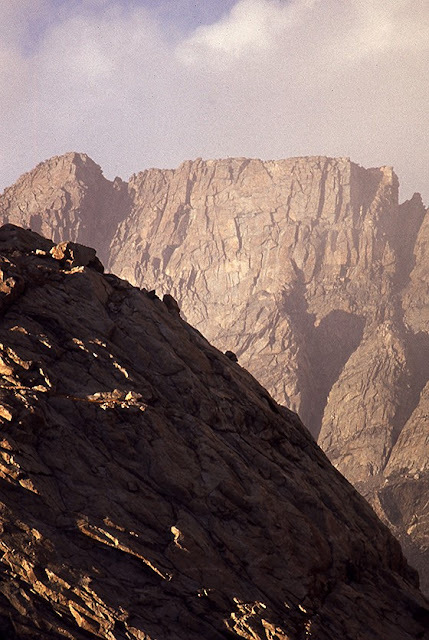 Also remarkably, Harrower is only the 28th tallest mountain in the Wind River range. 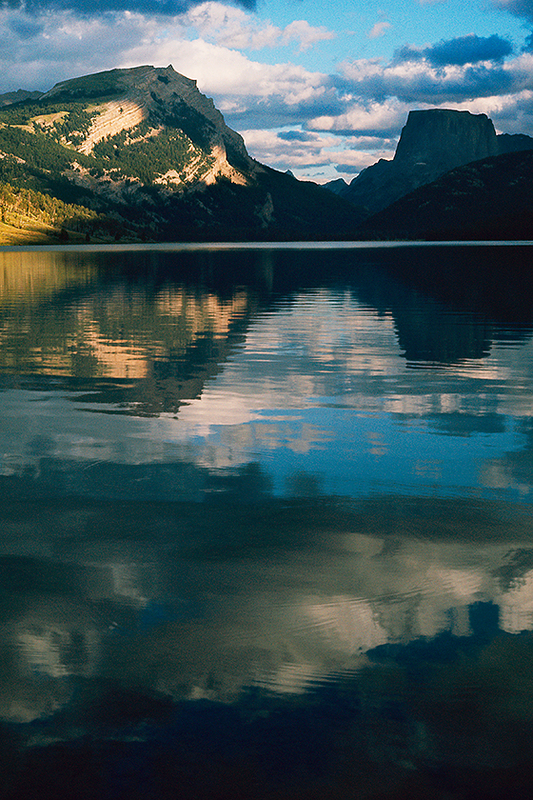 Ten of the tallest peaks dominate the skyline of where I am headed tomorrow morning, Island Lake . 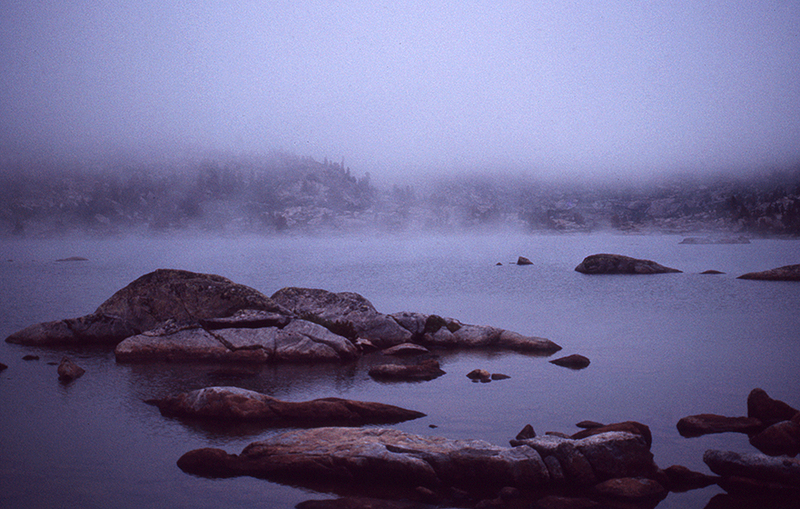 Wind River, #55: The morning of our Cook Lake circumnavigation begins clear and warm. Belle Star, my black lab, and I take a simple stroll along the shore, enjoying some beautiful gardens and rock peninsulas. Cook Lake is sparkling, and we can see lots of fish in the water. However, the lake is deceptive large and the traverse takes much more doing than I expect. When we finally reach the far end, the steep walls and boulder fields of Mt. Lester and the Elephant Head tower above us, and are of much greater scale than they seemed from camp. It takes awhile for us to work through and around this terrain, but it is nothing like the badly-judged clamor up the rock wall at Clear Lake on our previous hike (posts #11-37). In this picture you see the face of Elephant Head (the summit on the left) as it extends to the Cook Lake shore. On the right, in the dark gorge, you can see the whitewater of the river coming out of Wall Lake from the basin above. Belle and I navigate the Cook Lake shoreline with little difficulty, it just takes more work and is much larger than we thought when starting out. Now we have come to the river flowing from Wall Lake, where we expect to cross and join the established trail. Good luck! Another judgement error about scale - the river is BIG, fast, and cold, and the gorge is really steep! We are NOT getting across at the Cook Lake shoreline safely, so we must go up along the left side of the gorge and hope we can find a crossing in the Wall Lake basin. It is another 1,500ft of climbing, and we do not know what we will find, but we are relieved that a crossing can be made. Belle and I stop for snacks and water, while we take in Wall Lake and its VERY dramatic basin, and then we return to the trail and head back to Cook Lake. There are no more surprises on our walk home, other than being reminded once again that Cook Lake is really large, and walking around it takes much more time than I expect. It is getting dark by the time we finally return to camp. We have been out ALL day! Wind River, #54: Looking in the opposite direction (from the last post) I can see the other end of the lake which comes to the foot of Elephant Head peak and Mt. Lester. 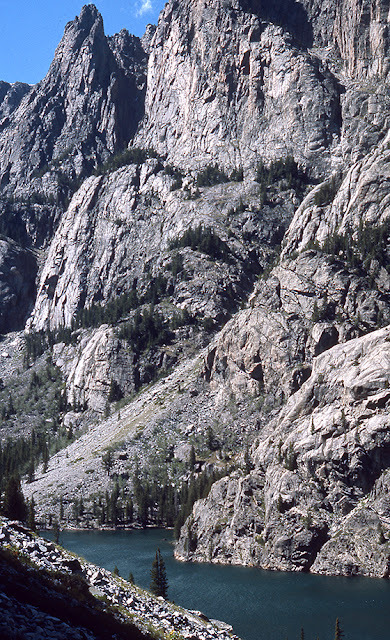 In this shot, Wall Lake is in the basin behind the rolling dome on the right. I study this view as the sun sets, and then again in the morning, before I make another significant decision that will prove a further learning experience for Belle and me. I decide the next day's adventure will be to see Wall Lake, BUT, since I am already more than halfway around Cook Lake (and it is quite large), I reason that rather than backtrack to where I hiked in, I will go around the lake on my side, traversing the view in this picture from left-to-right, and joining the Cook Lake/Wall Lake trail where it begins to ascend to Wall Lake. I mean, this does not look like the really vertical terrain at Clear Lake (posts #11-37), where I made a small error in judgment about scale... and yet, what can I really see? Wind River, #53: The campsite my black lab, Belle Star, and I have found is PRIMO! It is about 100ft above Cook Lake, and affords dramatic views up and down the entire shoreline. The weather has cleared completely, humidity has dropped, and the lake is shimmering in the breeze and late evening light. I get our tent set up, and take my rod down to the water edge, for a little fishing from atop a ledge. Being in a less-frequented part of the lake, there has been limited fishing here, and I am successful immediately because the trout are not wary. Belle is VERY excited as she LOVES trout as a supplement to her dry food, so a good evening is had by all, and she and I enjoy our dinner as we watch the radiant light sweep the landscape, and then fade away. In this view, I am looking at the south end of the lake, where I walked in on the trail from Pole Creek. Wind River, #52: As Belle Star, my black lab, and I navigate across Pole Creek and around the west shore of upper Cook Lake, the weather not only completely dissipates, but the humidity breaks and it becomes more comfortably arid. Even though we are off-trail, we are traversing relatively flat terrain without too much scrambling around. The calm, glassy lake and granite rock gardens are radiant in the late light, and Belle and I find a number of nice spots, but for some reason I keep pressing on. Eventually we come to a dome we must climb, as it drops sheer to the lake. It is not very high and quite easy to surmount, but I had no way to realize what we would find at the top. The dome is broad, supporting a few trees, and there is a well established campsite with a fire-circle that faces a SPECTACULAR view. There is no one there, so dog and I are home for the night. Wind River, #51: It is clear to me that there many nice places to camp, so I am in no hurry to don my backpack and leave the vantage point of the granite peninsula upon which Belle Star, my black lab, and I are resting. As day draws down, the build-up of weather dissipates, and the sky grows ever clearer. The angle of the setting sun REALLY defines the sculpting of the surrounding rugged summits. 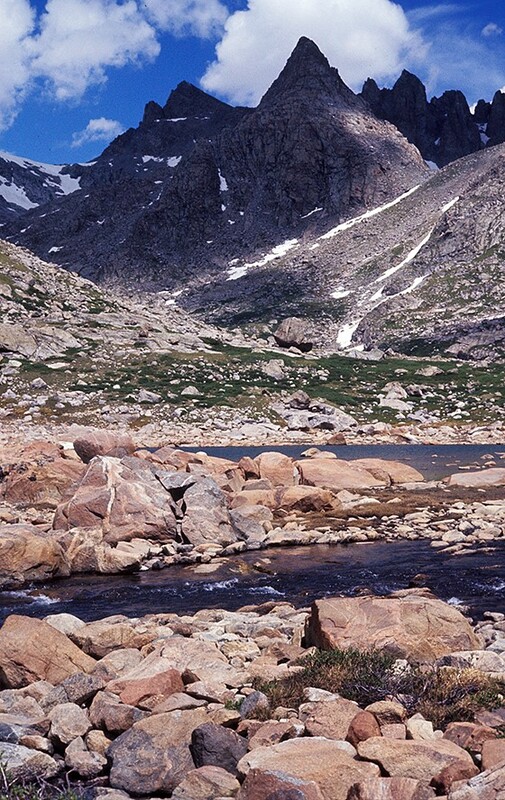 I have finally entered a truly deep part of the Wind River range, and this IS the rumored world-of-granite in which my friends and I have come to camp and hike. 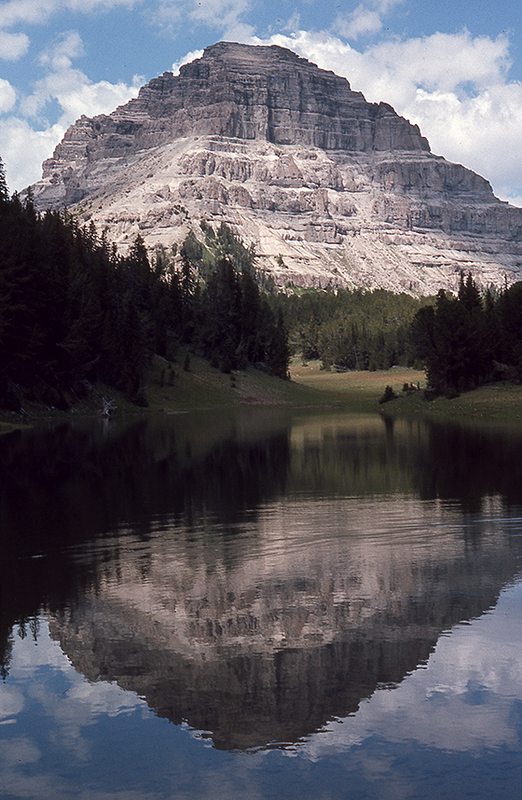 To the right is Elephant Head peak at 12,160 feet, and to the left is Mount Lester at 12,342 feet. They look just AMAZING! But, it is finally getting late, and Belle and I need to find a campsite and set up house. We groan back into our packs, and then I make a great decision. The Cook Lake Trail continues off to Wall Lake, around the east shore of the lake. Although there are meadows along the trail in which to camp, they seem too close to the trail, so I decide to cross back over Pole Creek, and search for a site around the western shore of Cook. 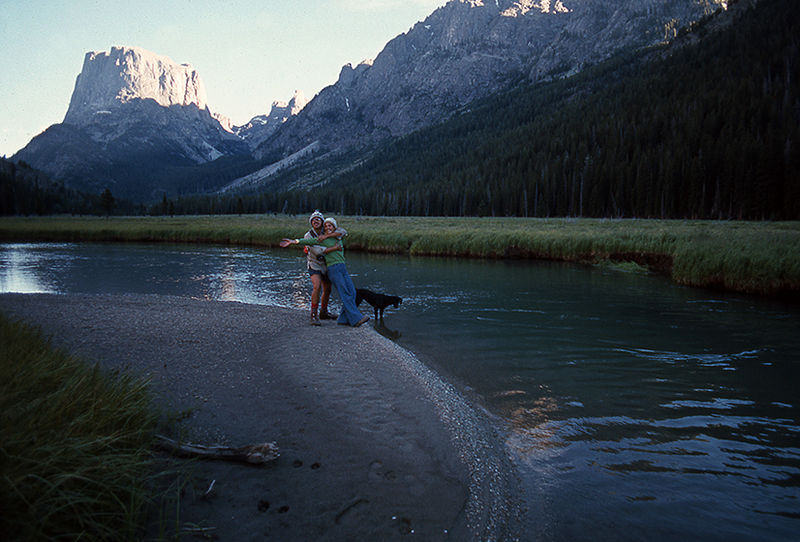 Wind River, #50: Things are never as close as we (my black lab, Belle Star, and I ) might wish. After crossing Pole Creek, the terrain does, thankfully, flatten, but the upper Cook Lake is still some distance. It is surprising to me that as large as it is, it is not yet visible... and then suddenly, with a modest turn in the trail, there it is! 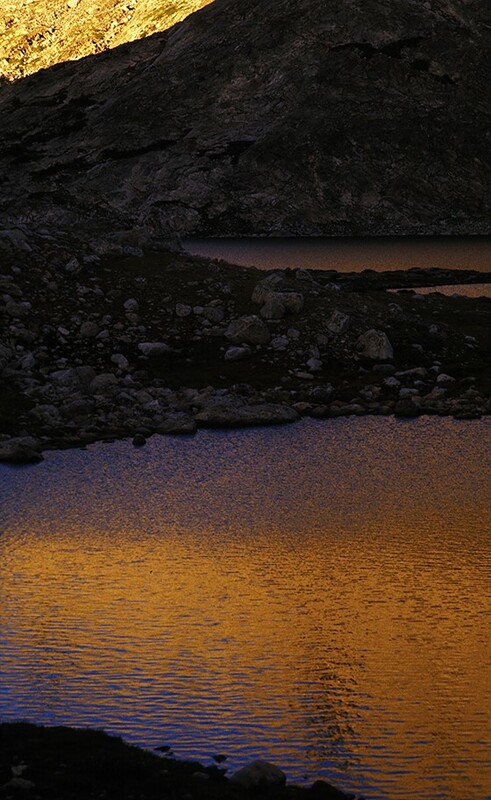 The scope of the landscape in front of me, and the beauty of the lake, take my breath away. EVERYTHING is blooming! There are flowering meadows everywhere, and more granite than I have ever seen. The weather gods are kind, and light clouds keep the heat away, so Belle and I take off our packs and settle onto a lovely rock peninsula to take in the view of our new “home” for the next few days. A great afternoon is to be had by all. Minimal insects, lots of water and snacks, and as the day wears on, conditions only get better, and the lake basin puts on an evening show. Wind River, #49: Proceeding from the lower Cook Lake to the upper one, there are a few brutal elevation gains that keep my black lab, Belle Star, and I moving slowly (especially me). Even so, our progress is relentless and seems to be paying off. By late afternoon the trail flattens out and this comes into view. The impressive summit on the left is Elephant Head. If you follow the right side ridgeline down, you can see the gorge created by the river flowing out of Wall Lake. 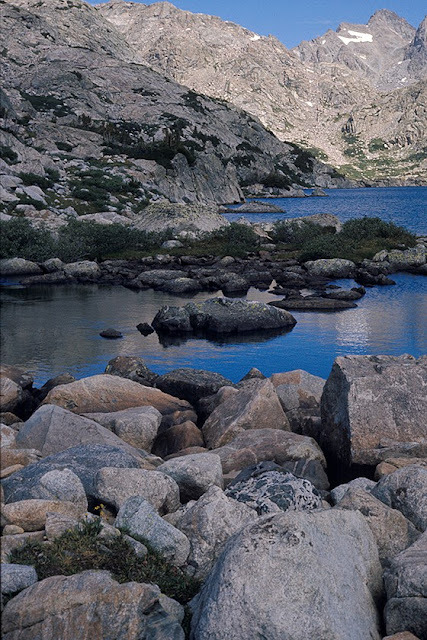 The upper Cook Lake, where we hope to camp, is somewhere just ahead and to the left, at the foot of Elephant Head and 12,342+ feet, Mount Lester, out-of-sight and further to the left. The last challenge is crossing this considerable river that has no bridge. Belle does not think it a big deal, but rock-hopping with my heavy pack is not fun, and actually dangerous, so I hope all of the effort proves to be worth it. (Just FYI: That fin-like summit in the distance is Harrower Peak, 13,057 feet.) Yeow! Wind River, #48: There is a lot of up-to-go-down on the trail to the Cook Lakes, and under my 10-day pack weight, I am stumbling along. 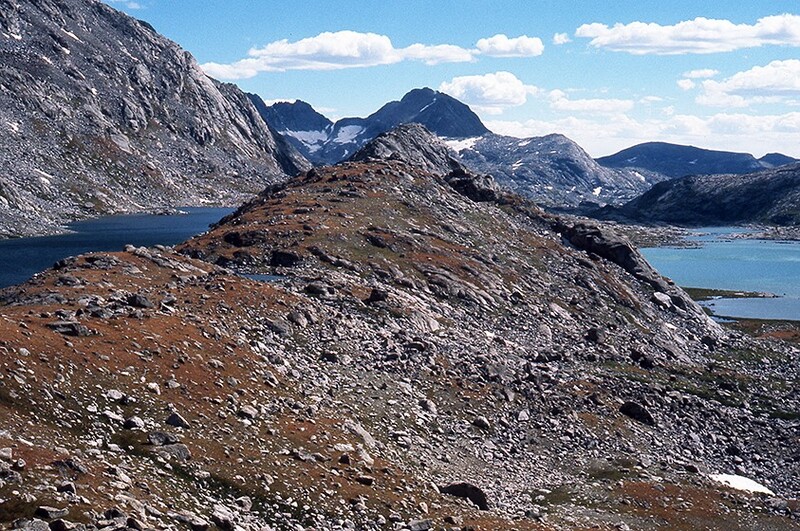 Nonetheless, with each step the terrain becomes more beautiful... more granite. Summits and domes are everywhere. Around 2 p.m., the weather that appeared to be building, dissipates completely and it returns to being very hot. Just about the point I am toast, Belle Star, my black lab, and I arrive at the “lower” Cook Lake. It is huge, and has a beautiful convoluted shoreline of rock and gardens. It is time for our lunch break. While munching, I study the topography, trying to better understand my surrounding environment and identify distinctive summits. Because the “upper” Cook Lake is even bigger, I am also wondering exactly where it might be. At 10,200+ feet, the upper lake is still above me, but if I am reading the topo correctly, that summit on the left in this view is Elephant Head. Between Elephant Head and the dome to the right, Wall Lake lies hidden, and the upper Cook Lake, should run to the feet of Elephant Head. Belle and I still have a good distance to go, however with food, water, and a little rest, we have recovered, so the packs go back on and we march forward. 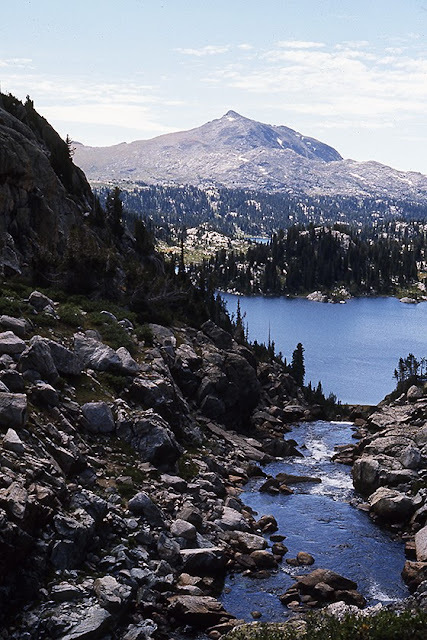 Wind River, #47: As Belle Starr (my black lab), and I work our way toward the Cook Lakes, we begin to gain more elevation and the trees become fewer and farther between. This is very different terrain from my experience in previous weeks hiking around Clear Lake. 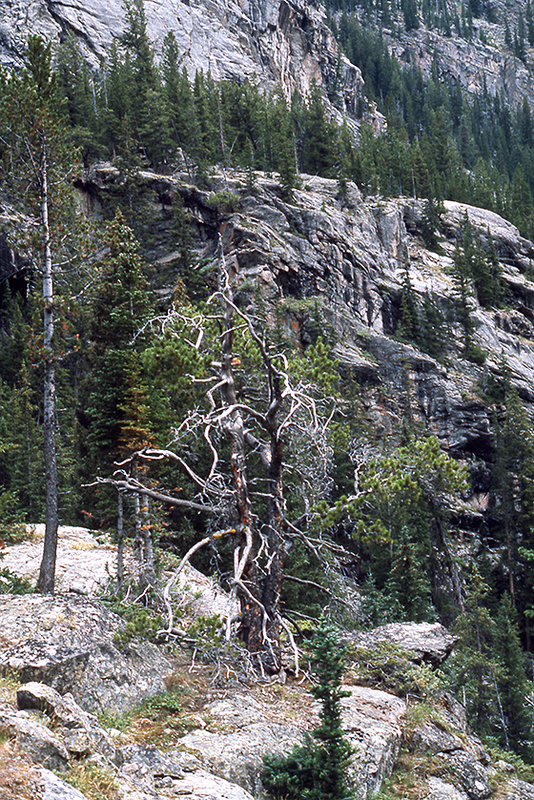 Clear Lake had many trees and was in a narrow canyon between towering peaks. On this trail I am already at a higher elevation than Clear Lake, and I still have some miles to go and elevation to gain. 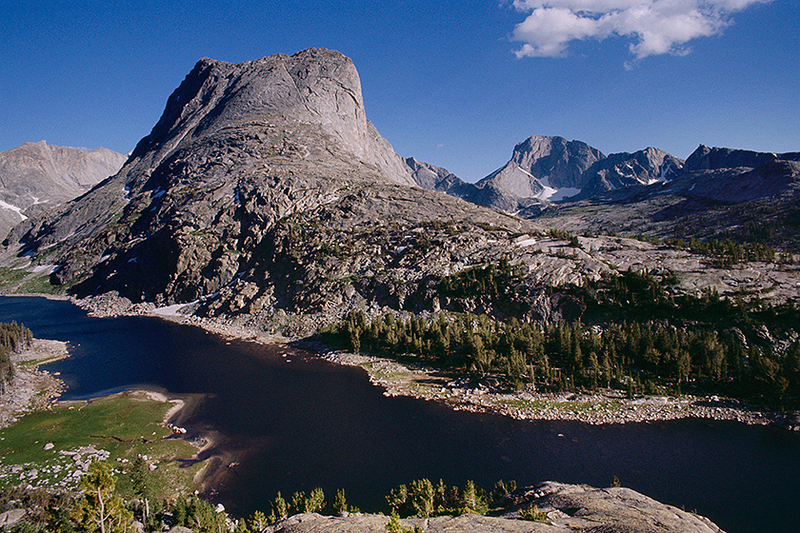 The landscape is broad, with expansive meadows and a stunning amount of clean granite EVERYWHERE. There are streams, tarns, and small lakes everywhere, as well. Ahead of me in the distant peaks, it appears that midday weather is beginning to build, but it is hot, so I welcome some cloud cover. My backpack is 10-day-heavy, and I am tired after several hours, but the rolling domes of granite bedecked with hanging gardens, energize me, and beckon me ever upward. Belle does not like her pack any more than I like mine, but she is ready to role because there will be places to play and trout to eat when we finally stop. Wind River, #46: Ever since it snowed on us when we walked in three days ago, the weather has been hot and relatively clear. On this morning that seems to be the case as well, although there are a few more clouds. Mike and I have a good breakfast, and then break camp. He is walking about nine-miles, back to Elkhart Park, his car, and a return to civilization. Belle and I are “soloing” and headed for the Cook Lakes, about a six-mile journey with a modest gain in elevation, AND much further into the heart of the Wind Rivers. We will camp there for a few days, and then continue on to meet my friends, Chris and Cathy, who have gone to Island Lake. The cool of the morning and the reasonable trail are most welcome, because I am now carrying a REALLY heavy pack. It also helps that the walk is beautiful with many flowering gardens, and spectacular trees. It seems to get better with each passing mile, like there is an energy building in the landscape as I get closer to these new lakes. Wind River, #45: With great weather and fantastic views, Mike Knowlin and I spend most of the day up on the dome we have ascended. In the late light of evening, we finally climb down to the lakeshore to do a little “soul” fishing - actually my dog, Belle Star, is demanding trout for dinner (LOL). Our camp is behind the trees on the left side, and the massif in front of you is Bald Mountain, also noted in the last post, but from a very different angle. From my lake-level POV, the size of this granite dome is amazing, and the topo maps indicate there several large lakes in pockets, well up the flanks of the peak. The scale of the Wind River Range is finally beginning to register,..but only just barely. In the next few days my understanding will take some quantum leaps. For now, the fish are biting. 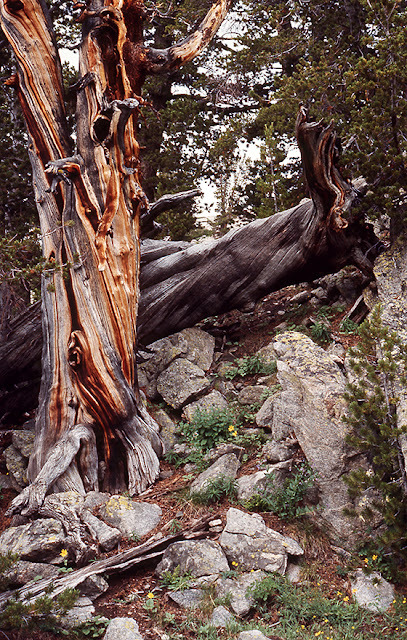 A last note about this image - although I did not know it at the time, and probably thought it unimaginable, I would return to Bald Mountain several times to camp at various lakes, but most amazingly, I would come with an expedition group and summit Baldy in the WINTER, then ski down, for a story in POWDER magazine. 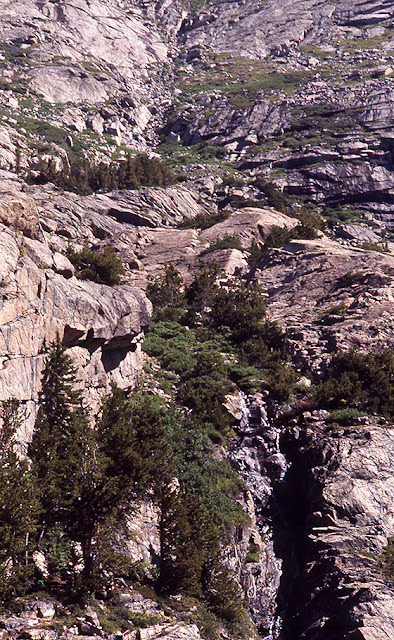 Wind River, #44: The granite dome that Mike Knowlin and I ascend is an easy scramble-up of ledges and small gardens. Our weather is perfect - hot, with a light breeze, a few clouds, and LOTS of visibility. Mike will walk out tomorrow, and I will go solo, walking to Cook Lake, deeper into the range, so on this day we are just cruising and taking it easy. Our thought in summiting this dome was to have an overview of our lake, and to see if I could read any of the terrain I would hike into tomorrow. Atop the dome, however, we discover it offers much more. 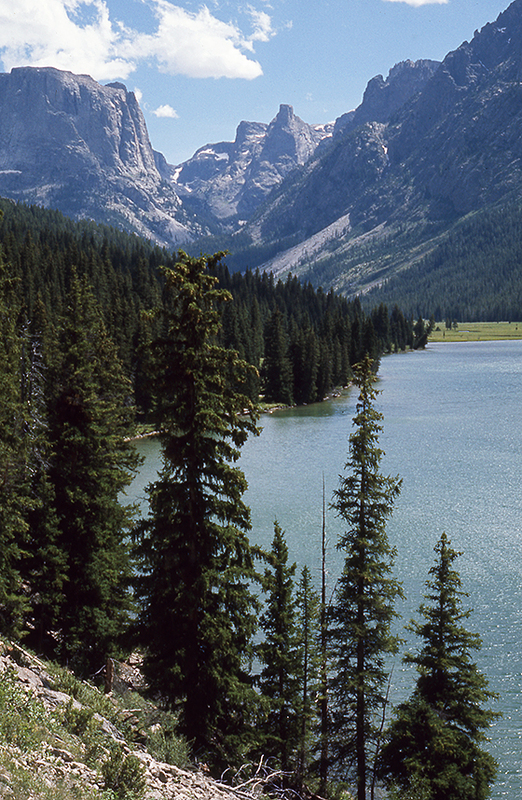 We are camped at the largest of the Pole Creek Lakes, but as it turns out, there are quite a few of them. Our lake connects to another large one, and then there is a series of smaller ones that descend down a valley. We can walk along the top of the dome for quite a distance, and the clarity of the day lets us see all the way out onto the high plains around Pinedale (image, right). 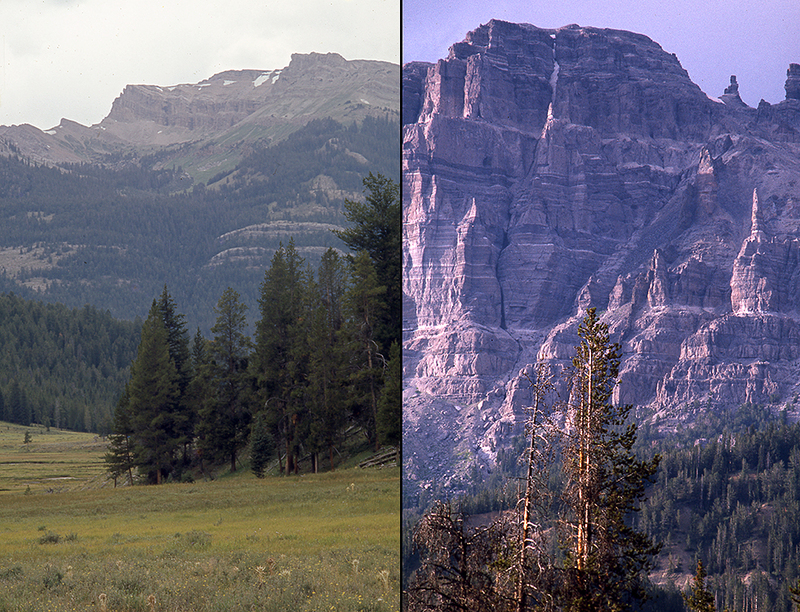 The peak in the far left of the left frame is Bald Mountain. Our camp is in the trees below it, and I will walk around its base, hiking in to Cook Lake tomorrow. It is also notable that there is a much smaller insect population up here than there is down at the lake. Wind River, #43: After a great trout dinner and a beautiful evening, Mike Knowlin and I, retire early, intending to rise with the sun and summit a nearby mountain. The morning breaks clear and without any sign of weather, so we quickly fix a breakfast and organize our daypacks. Leaving our campsite to approach the base of our climb takes us through dazzling morning meadows. Although crushed to the ground under the weight of snow from the storm, now two days previous, all the grasses and blooming wildflowers are beginning to “rise” as two sunny, warm days in a row are now reviving them. Have some scarlet paintbrush! Once again, proof of a long held DFC&FC view, that a secret army of bonsai gardeners attend all alpine gardens. Now, “The Higher You Get, The Higher You Get." Wind River, #42: On our first day camping at Pole Creek Lakes, Mike Knowlin and I enjoy the warmth and lack of threatening weather. Re-energizing after the 9-mile backpack through a snowstorm on the hike in, our hours of fishing, swimming, and gawking this day are the perfect recovery response. 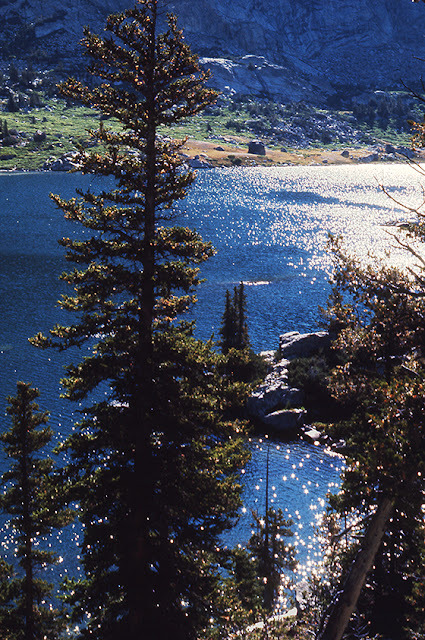 The Pole Creek Lakes are numerous, and several are large. 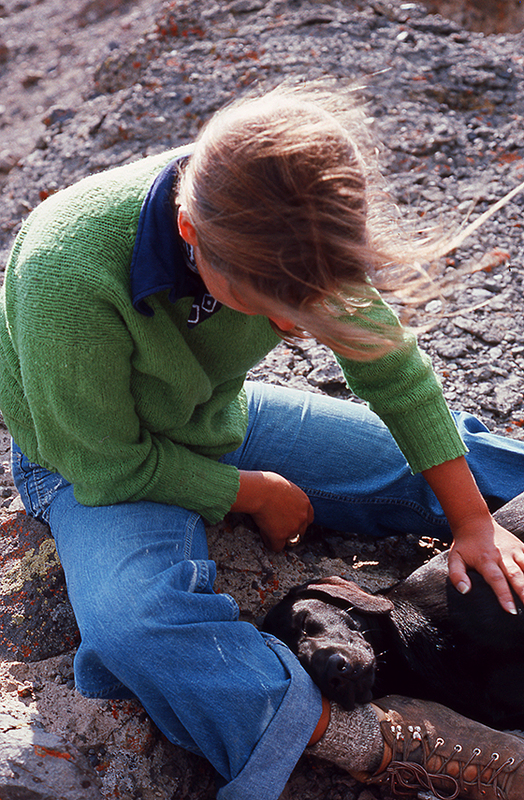 Their shorelines are granite terraces and peninsulas, occasionally broken by a meadow, and there are numerous shallow bays in which Belle likes to chase the fish. Knowlin and I stroll, snack, and cast our day away. Back in camp for trout dinner, we enjoy a beautiful twilight near our tent site on a small jetty of rock overlooking the lake. Although some clouds have come into the sky, there is no weather build-up, and we hope for another day like this, tomorrow, as we have decided to summit a nearby mountain to have a better look around. Wind River, #41: Because it is the first week in AUGUST! and it started out hot and clear, it is pretty amazing that in the middle of our 9-mile trail walk into Pole Creek Lakes, Mike Knowlin and I are beset by a snowstorm. Even though it is putting down several inches, we reason it won’t last forever and push on. Arriving at the lakes, we are wet and cold, but we find a great campsite. The snow has stopped, the lake is shrouded in fog. Intending to dry out while fixing dinner, Knowlin builds a big fire which we huddle around, while our wet clothes steam. Warm, fed, and finally dry, we retreat for a good night’s sleep. What a difference a day makes! We awake in the morning to a crystal clear sky, a hot sun shining, and nearly all evidence of yesterday’s snowfall, vanished. By the time we finish breakfast, we are in shorts and t-shirts, and my dog, Belle Star has gone swimming, something she does on-and-off for the rest of the day. Mike and I go fishing, and are successful - me especially so. After a bad cast and reel-in, my lure drags on the bottom, where I snag a lost wallet, recovering $25. The trout is tasty as well! 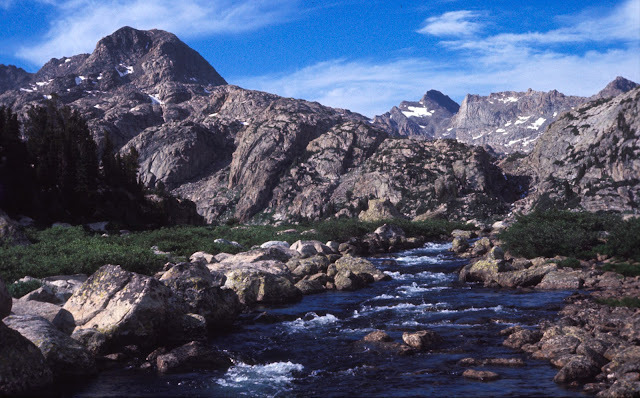 Wind River, #40: Mike Knowlin and I are backpacking into the Wind River Range ( wind River Range - Wikipedia ) on the Pole Creek Trail, bound for the Pole Creek Lakes, where we hope to camp. It is the first week in August and the day has begun clear and hot. Our hike covers about nine miles, and some time after the halfway point, the clear sky grows more cloudy and the wind begins to blow. About 3-miles from Pole Creek Lake(s), we are at ground zero of a screaming electric storm. There is DEAFENING thunder, lots of rain, a good bit of hail, and more lightning than either of us has ever seen. We dawn our ponchos and trudge on when we safely can between storm-cell bursts. This is now the second time I have been part of one of these summer thunderstorm assaults in the Wind Rivers, and they are amazingly fierce. Then, it begins to snow! Mike and I are just boggled! WHAT! Thunder while it is snowing - a fairly rare occurrence. We are now wet and cold, even having used the ponchos, so we press on to the lake and a hopeful campsite. While we walk, the storm begins to abate, and the rain, wind and lightning cease. The clouds remain low, so the day stays dark and gray, but warmth begins to return, and so does humidity. The 3-4” of snow that has accumulated begins to disappear as quickly as it arrived, and when we arrive at Pole Creek Lake, this is the view from a nice campsite we find. Wind River, #39: To reach Island Lake, Chris and Cathy have a big hike ahead of nearly 16-miles with a considerable gain in elevation (several times - too many up-to-go-down). Mike Knowlin and I have a much flatter trail of 9-miles that will take us to the Pole Creek Lakes. Our early start is perfect, as there are few others on the trail yet. It is a relatively clear day, so since it is the first week in August, we know it will be really hot later, and it feels good to cover several miles in the cool of the morning. Walking in on the Pole Creek Trail also provides some dramatic views of the tallest peaks in the range from an area called Miller Park. Then lakes begin to surround us everywhere - Miller Lake, the Sweeney Lakes, and numerous smaller ones that have no topo names. Finally we are at the trail juncture where we will split. 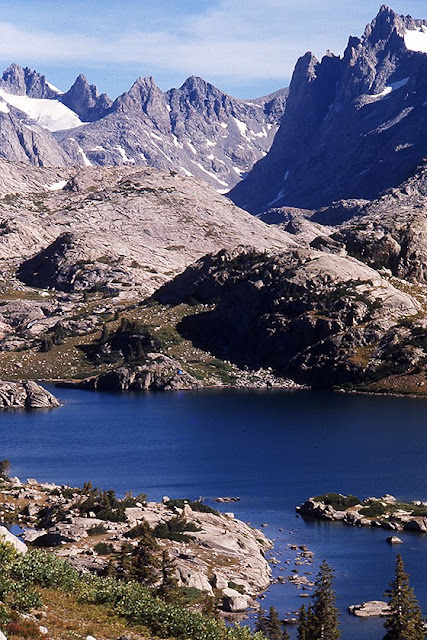 It is really hot, so in the shade of trees, we have some water and snacks, then Chris and Cathy head for Island Lake and the Titcomb Lakes Basin, and Michael and I follow the Pole Creek Trail to those lakes, where we will camp. 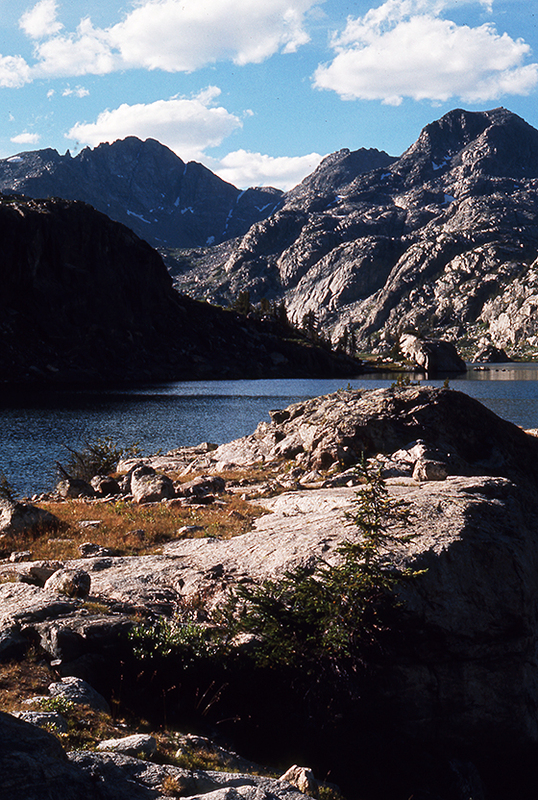 As he and I walk on and past Barbara Lake, we start to get into some exciting terrain of big granite. We also begin to have blustery winds and the beginning of building cumulus clouds, often the sign of possible afternoon thunderstorms in the summer. About 3-miles from Pole Creek, it becomes a VERY different day. Within a few hours of the picture above, the sky has grown dark, the wind is blowing hard and cold, there are occasional sprinkles of rain, AND we can hear thunder. Then, with little warning, all hell breaks loose! Wind River, #38: When Chris Korody, Cathy (soon to be Mrs. Korody), myself, and my dog Belle arrive in Pinedale, there is a flurry of activity. After 10 days of backpacking in the Green River Valley end of the Wind Rivers, we are very happy to have showers, real beds, and food that is not canned or freeze-dried. However, we are also meeting my good friend, Michael Holmes, who has been with three other guys, camping, hiking, and fishing in Montana and Yellowstone. 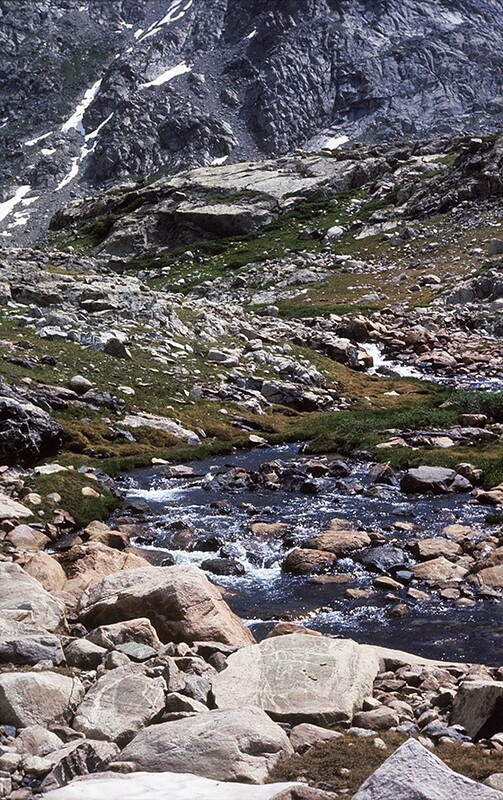 We intend to resupply, and then begin another backpack taking us to a different part of the Wind River range. When they arrive, however, we learn that Michael has terrible heel blisters on both feet, and of his three friends - all of whom are policemen - two need to fly home for duty. We decide that Michael Holmes should rest and heal, but that the remaining policeman, Mike Knowlin, and I, will walk in with Chris and Kathy and do the backpack trip. Knowlin can only spend four days, though, and not ten, so we devise a trail strategy. We will start at Elkhart Park, already a high-elevation trailhead, and we will walk the first 1/3 together. 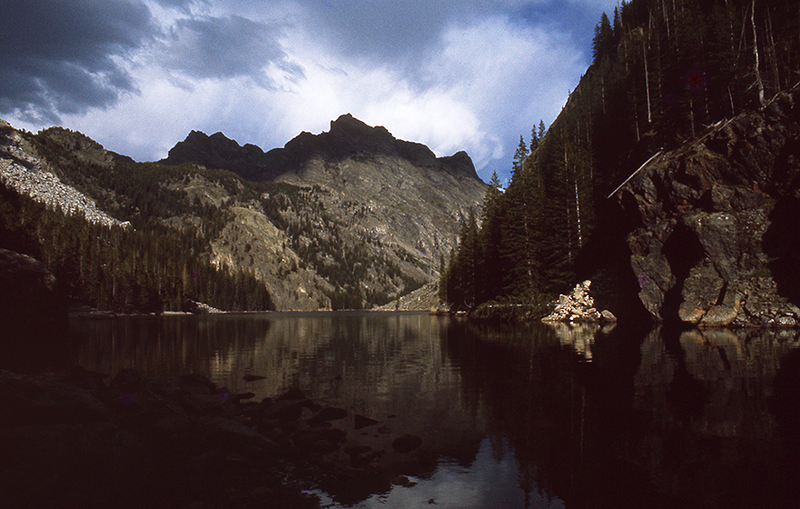 At a major trail juncture, Chris and Kathy will go to Island Lake, in the heart of the peaks. Mike and I will go to Pole Creek Lakes, fish and hike there for four days, then he will go out, and I will connect with Chris and Cathy. The morning of our departure is a lovely day in early August. It is summer-hot, wildflowers are blooming everywhere, and the trail is relatively trouble free, and very scenic. Wind River, #37: Our little “adventure” now over, this picture pretty much says it all. Having reunited with Chris and Cathy, my dog, Belle Star, simply lay down and passed out, once again happy to be in the company of friends. Having been chased by a terrible lightening storm the night before, and today, following me through my stupid “extended” hike, has been more than enough Wind River for her for the time being, and now she just needs some love (and food - LOL). The weather blows through without breaking over us, so after some early evening snacks and a good rest, the four of us descend the trail back to our campsite. The remaining evening is uneventful (no sudden storming) and in the morning we break camp and head back to the Green River Lakes trailhead, and our cars. We are going to drive to nearby Pinedale where we expect to meet my friend, Michael Holmes, and three buddies of his from San Francisco. 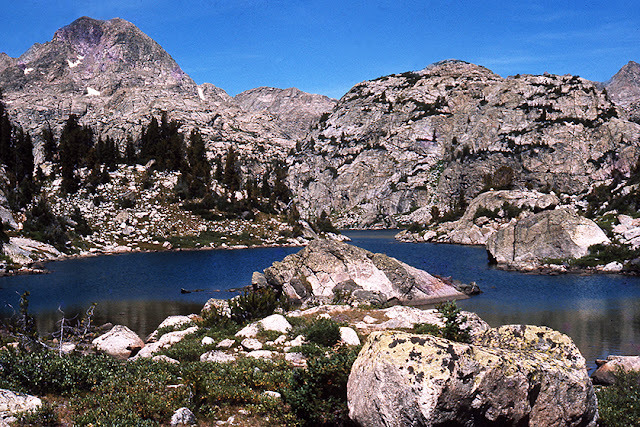 They have been camping and fishing in Montana, and Yellowstone, so I have proposed we all meet in Pinedale, restock, get some hotel rest and restaurant food, and then go into the heart of the Wind River range through Elkhart Park, just outside of town, which has a starting point trailhead above 9,000ft. Wind River, #36: With everyone much happier now that Belle and I have descended from our foolish position on the sheer wall above Clear Lake, Chris and Cathy begin to collect there gear and deflate their raft. Belle and I navigate the final section of shoreline and the crossing of the outlet stream, intending to meet them at the point where the trail starts back down to the meadow in which we are camped. The shoreline is a simple traverse, but the outlet is a little tricky because there is a lot of fast, deep water, and a maze of wet rocks I must hop across. Belle could care less and simply goes swimming because she can see Chris and Cathy approaching and she wants to greet them. Across the lake is the most direct line. While she pursues them, I stop a moment for this. 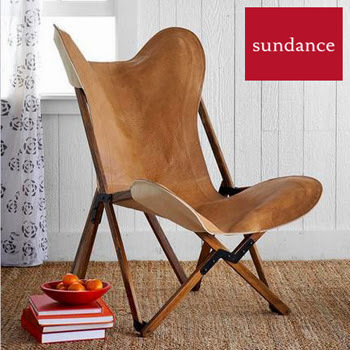 Hey, we finally got “alpine” in the Wind Rivers. 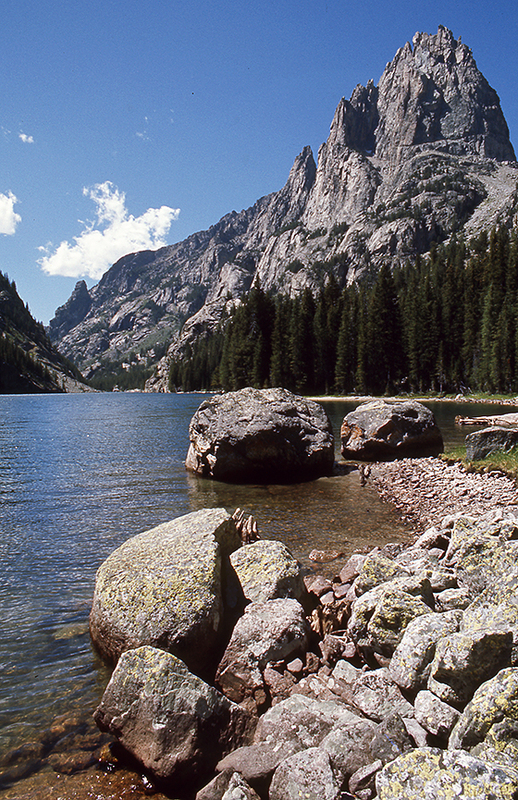 There are definitely lakes, fish, and plenty of granite. Now what have we learned? 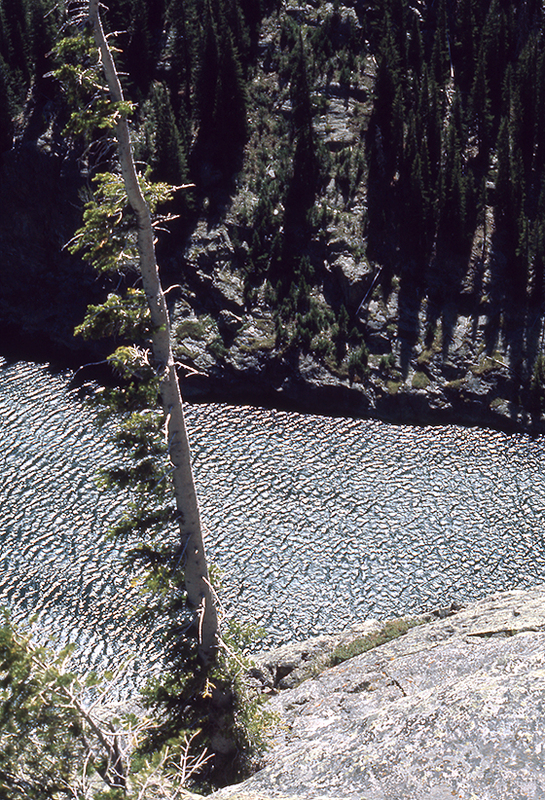 Wind River, #35: Chris and Cathy can hear me calling to them from my precarious position on a sheer granite wall at Clear Lake, but it takes awhile to actually see my dog, Belle, and me because we are so small and insignificant. Once they realize where we are, and I explain the predicament, they are none-to-happy with the choices I have made, and to make matters worse, the late afternoon weather seems to be building once again. The LAST place I want to be in a screaming lightening storm like the one we experienced last night, is up in these ledges, completely exposed with a terrified, wet dog. We need to get down ASAP! Cathy is ashore, and Chris paddles in as well, so they can break out binoculars and do some scouting for me from their side. Shouting out directions they think will lead us down, we spend about 1/2-hour trying various routes, some of which work, and some of which don’t. All the while the weather keeps building. Then, just as one especially dark cloud sweeps over, Belle and I come to the end of a terrace choked with stunted trees, and this sculptural fallen trunk is aglow in the storm light. I take it as a cosmic sign, climb around the rock, and push through the trees. The sheer wall disappears. Belle and I are back in forest, and a short descent brings us to the lakeshore in a matter of minutes. We are finally safely down! Wind River, #34: The granite bench Belle and I occupy momentarily, is great relief from the tiny ledges and vertical exposure through which we have been climbing. It seems to extend a good distance, so we walk along it trying to take as much advantage as we can. I am intending to find my friends, Chris and Cathy, who stayed on the opposite shore to fish and sun, and I am hoping from their viewpoint, they might be able to guide my choice of terraces, and get Belle and me off of this vertical face. 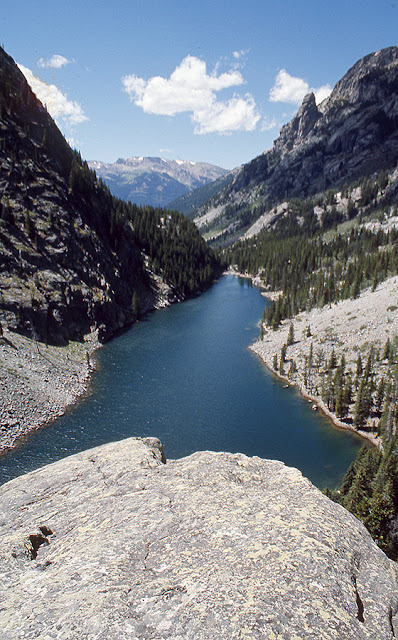 Our navigable ledge shortly brings us to this expansive view, and now we can see our destination, the end of the lake. Just ahead, on the opposite shore, I can also see the cove where I left my friends earlier in the day. Excited by the hope of communicating with them, Belle and I are about to continue our wall traverse, when a funny, little orange raft floats into view just below us. Chris is chasing trout! Perfect! Perhaps, now, we are saved. Ahoy, matey! Can you hear me? Wind River, #33: Belle and I finally reach a ledge broad enough to allow us to sit a moment, relax, and further consider our situation. I estimate that we are about 800ft. above the lake, and VERY close to the end we hope to be. Unfortunately, almost every forward move I make has taken us higher up as well, and from what I can see, it appears that will continue. I also realize that we have climbed such a meandering path, we could never retrace our steps and find our way back, so going forward is now our only option, and I am truly flying blind. There are connections between some small granite benches that I can make, but clearly Belle cannot, so my choices are limited. Because she swims so well, and LOVES cold water, I even ponder throwing her off, into the lake, but conclude we are too high, and the impact might injure her, or knock her out. Then, it occurs to me that Chris and Cathy are on the far shore, somewhere, so if I can call to them, perhaps they can see my dilemna, and guide my choices from the opposite shore, from where they have a MUCH clearer POV. Wind River, #32: Having left my friends to fish and sunbath, my dog, Belle, and I are attempting to circumnavigate Clear Lake, only one side of which has a designated trail. Now that we have abandoned that more sensible path, she and I are scrambling across boulder fields and around ledges. 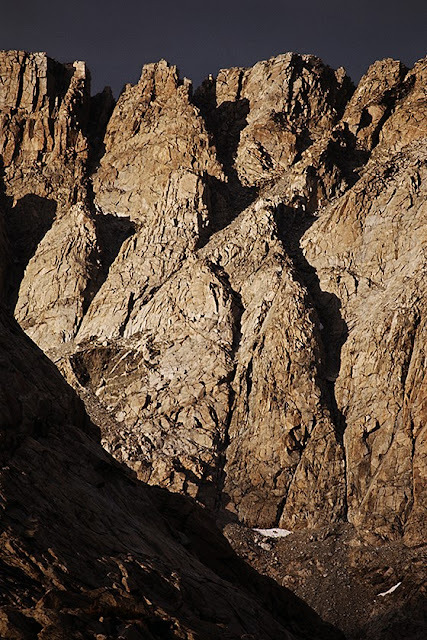 We do negotiate several sheer walls that to drop into the lake by climbing around them, using connected terraces, but when we are about 2/3 of the way along our shore, and far too committed and tired to retrace our path, we meet one last VERY large face. The climb up has been intimidatingly steep, and before we even find any lateral pathway across, we ascend to our highest point of the day. This is our new world! 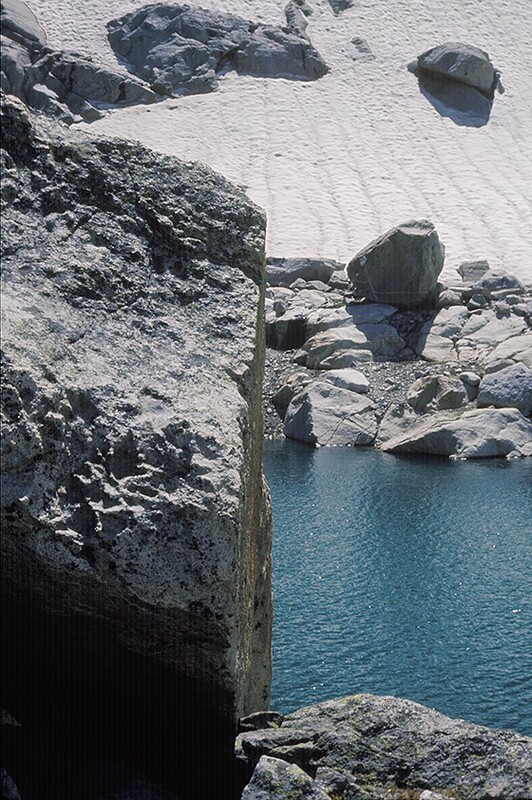 Narrow, unconnected ledges with stunning vertical exposure, and no sense of what path to choose forward, because from this POV I cannot see anything. From one terrace to another is just a best guess, as we try to move on. Wind River, #31: When I look back at this image now, I realize that this is the moment when I should have considered returning to my friends via the established trail, even though it would have been a long walk. Instead, my dog, Belle, and I opt to reach them by circumnavigating the lake which involves a few sheer wall-into-water faces we must climb around by (hopefully) finding inter-connectiing, navigable terraces and ledges. So far, our gamble has paid off and we have surmounted three sections, but now we have come to the this last one, and it is strikingly, and unrelentingly vertical. We are almost home, at least 2/3 of the way back, and as WRONG as this looks, I reason we are to tired to retreat, and this will look better once we are climbing, so we start up. It is not hard to do, just wearing and slow, but where are we actually going? Wind River, #30: The Clear Lake trail I am upon continues into deep forest after the bridge, so for awhile I stare up the divergent Faler Lake trail, but reason that the day is getting short and the climb up would take a good deal of work and time. Belle and I, therefore, ponder a return to my friends, but by way of OPPOSITE shore, rather than the one we have just walked. This was something I had thought about while sitting with Chris and Cathy on the dome earlier in the day. My concern at that time was whether or not Belle and I could navigate around several sheer walls that came down to the lake in deep water by climbing over them using ledges. Having now seen these three backpackers come down a BIG wall, I feel confident there is plenty of room to scramble around anything that might be an obstacle to our return, and so we are off. If you look back at post #27, you will see in that view that the far shore is MOSTLY navigable boulder rubble, with just an occasional sheer face, which is just what we encounter. The traverses take a lot of work, but the boulder rubble is easily managed and our encounter with the first walls is uneventful. We climb around several quite easily using ledges and terraced gardens. At a point about 2/3 of the way back, we are nearly opposite the dome where I left my friends, so I am hoping to see them. Belle and I are also WAY too far around the lake to consider retracing our steps to head home, so we just need to get around this one last sheer wall,..and it is a bit more intimidating than the previous ones we have encountered! Wind River, #29: It is clear the three backpackers are descending from somewhere, and apparently they are on a trail, so Belle and I decide to wait until they reach us so we can question them. As they draw closer, their voices become more discernible above the water noises, and I can tell that are happy, laughing, and complaining a lot about the rugged down-climb. The trees and rocks hide them until they are almost upon me, and when they emerge, they are on the far side of the bridge. We greet each other, and they use conversation as an excuse to shed their packs and drink water. They tell me they have just come DOWN from Faler Lake, which I saw on the crude trail map, but did not know where it might actually be located. Apparently, it is about 2-miles of trail and 1,200ft above me. The bridge crosses the outflow from Faler. When I ask about fishing, they go nuts! Not only was Faler great fishing, but another lake, Native, was MUCH higher (!!!!!) and even better, sporting large Golden trout. Because they are walking all the way out today, the three soon hoist their packs and continue down the trail that I walked in upon. Belle and I, on the other hand, cross the bridge. Wind River, #28: Just steps beyond my expanded view that has opened up, the sound of rushing water intensifies greatly, and I come upon a very large river flowing into Clear Lake,..so large it has a significant bridge. I have also arrived at the “end” of Clear Lake, as once I cross the bridge, the shoreline begins a return along the other side. While I am pondering what I might do next, the splashing water begins to echo around the steep walls beneath which I am standing, AND I am sure I can hear voices. They seem to be coming from ABOVE on the rock wall..somewhere. Belle hears something, too. Along with no topo map, I also have no binoculars with me, so I strain to see color or movement that might confirm people are are up in these rocks. Look at the tree group, highest on the left-hand side of this image - there are three guys in those trees wearing a lot of colorful gear. No you cannot see them in this shot, AND they would be SO small, even standing on the rocks in front of the trees, they would just barely be noticeable. When I finally see them, I am boggled by this realization of scale, AND where are they coming from? Wind River, #27: The previous post of Mt. Osborn is from my side of the lake. Looking toward the other side, I am studying those walls with the same consideration, what is navigable, and what is not. Although the boulder field you see here is hard work, it is simple enough to traverse, but when you come to the sheer walls at water's edge, that obstacle must be circumnavigated. Are there enough CONNECTED, tree-supporting terraces to work around or over that face? Who knows! Hard to tell from here. Hard to tell anything with so little experience in these mountains and NO topo maps. BUT, next best thing is to learn first hand by exploration, so snackies ingested, sun-warmed, my dog, my loaded daypack, and I, scramble down from our dome and rejoin the trail. It parallels the edge of the lake, wandering in and out of trees, and crosses a surprising number of small streams. The shoreline is much larger than I realized, but it finally takes a bend to the right, where the view of a much deeper canyon opens up. Ahh, I think! This must be where those other lakes are hidden. Wind River, #26: While sitting, snacking on our sunny dome, I survey my surroundings, trying to judge, scale, distance, and navigability - where can I go, where can I not. Above us is Mt. Osborn, which looks formidable, but as a true colleague of the DFC&FC, I am always interested in getting to the top of things because I believe our motto, “The Higher You Get, The Higher You Get.” I view subjects like this to consider whether they might be ascended. It is important to this story to notice the tree-covered terraces and cracks on this face. It is clear to me that they are large enough to walk on,..but do they connect and go anywhere? That is to be the lesson of this day - learning to better read what can be traversed,..with a dog! 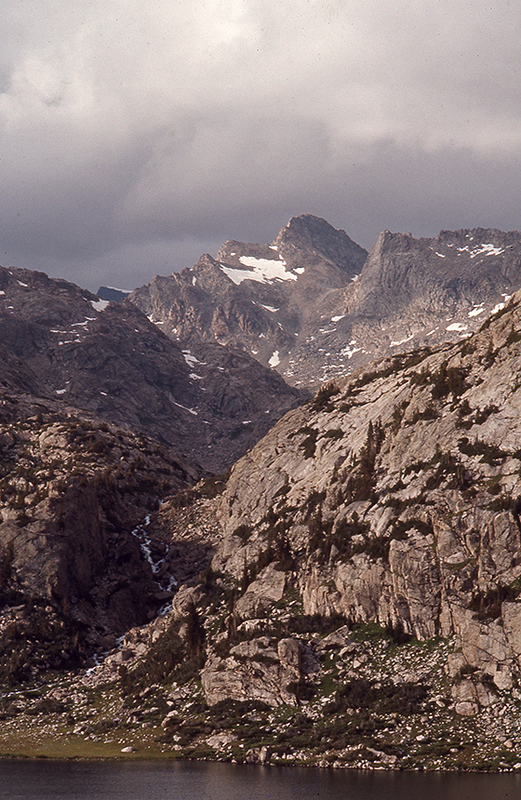 Wind River, #25: Looking INTO the Wind River range from atop our granite dome perch at the shore of Clear Lake is a very different view. The forested slopes have become fewer and further between, and the granite has emerged. Huge domes, spires, and glaciated faces are visible, well ABOVE our position at this point. I expect to see other lakes in this vista, as they were represented on the crude trail map carving, which also indicated they were larger than Clear Lake, but nothing is visible. Perhaps they are down in those trees at the end of the canyon. Clear Lake surprised us when we came upon it so suddenly, so who knows. On our dome, we are well above the lake and trail, and there is no one, nor any camps to be seen, and it is HOT. We shed clothes and break out lunch snacks, sunning ourselves for awhile. I bore easily, however, and remain curious about the rest of the lake, and the others I cannot not see, so I suggest we continue on the trail. Chris and Cathy want to laze-around more, though, and Chris brought his inflatable boat, and wants to go fishing. Sounds good, but not my style, thus dog (Belle Star) and I are planning a different adventure for our day. Wind River, #24: The first granite dome that we encounter on the shoreline of Clear Lake looks like an easy climb up, so the three of us do. All the better to have a look around. And, quite a look it is! The top of the dome is smooth lichen-spotted granite, warm to the touch because of morning sun. We can now see the entire lake and surroundings, but are still struggling to judge the scale of our new environment. Our dome is about 1/3 of the way to the other end of the lake from the outlet. Looking back in the direction from which we have come, we can see the narrow slot through which Clear Creek plunges into the gorge, and up which the granite “staircase” on our trail in, ascended. 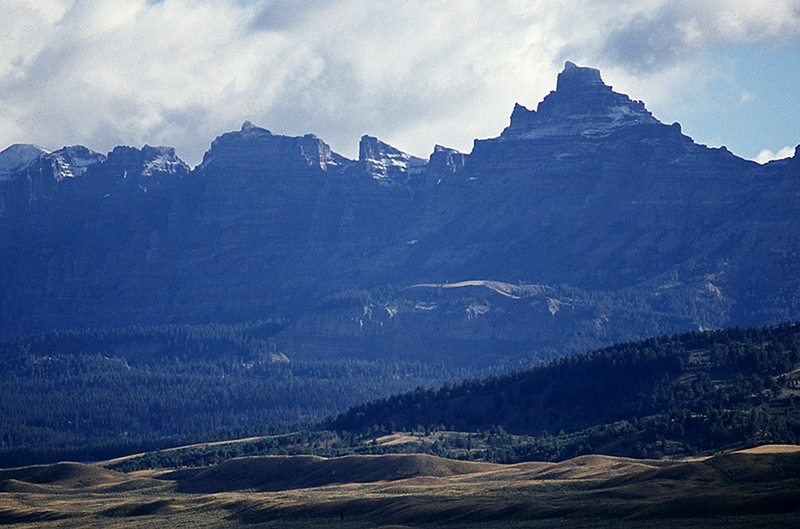 Mount Osborn is just out-of-frame to the right, and Flat Top Mountain rises to the left. At the base of the mountains in the distance lie the Green River Valley and lakes, where we have previously been camping. Of course, the other 2/3 of this lake is just a swivel of the head away. Wind River, #23: The trail continues into a cluster of trees that spread from the walls of Osborn Mountain, on our left, across a narrow valley floor, intersecting similarly steep walls of Flat Top Mountain, to our right. A short distance into the trees the echoes of Clear Creek fade, to be replaced by a different, louder water sound, which we seem to be approaching. Within a few more steps, I realize we are hearing a waterfall that marks the LAKE outlet, where Clear Creek pours into the gorge. We are about to finally see THE lake. Then, within very few steps, IT IS THERE! Very there! It is huge! It is narrow, long, and we cannot see the far end. It is also radiant, and SO sparkly in the morning sun, it is hard to see at all. Clear Lake is, indeed, clear. It has layers of beautiful colors, and as we are standing, staring, and trying to take it all in, a BIG trout flashes by. Everyone is excited. My dog, Belle Star, jumps in. We decide to explore our shore to see if there are camping sites (there are), and so we follow the trail for a bit, until we come to a large, ascendable granite dome, right at the lakeshore. The trail continues on behind, and around the dome, but the three of us all have the same idea. As our colleagues in the Decker Flats Climbing and Frisbee Club from Idaho would have reminded us, “The Higher You Get, The Higher You Get.” So, UP we go! 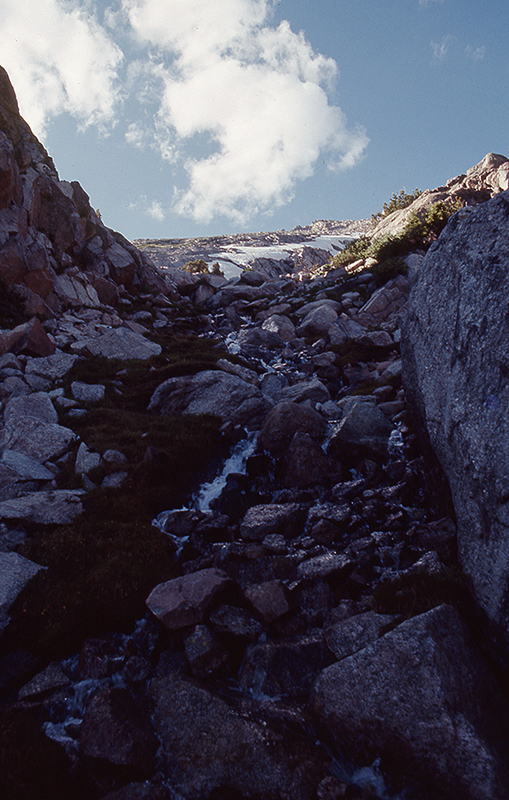 Wind River, #22: Granite boulders, walls trickling with water, and blooming alpine meadows, but still no Clear Lake, and the trail we are following seems to be approaching a wall. In what we would learn is a classic, steep Wind River “up,” the trail slips between huge boulders with a rock arch, and then begins a series of staircase steps straight up the narrow crack between them. It is not a long climb, but is does take our breath away as we are also gaining altitude rapidly. The crack leads to some small benches, which the trail continues up and over. Clear Creek now is loud, but well below us in a gorge that echoes that water noises. 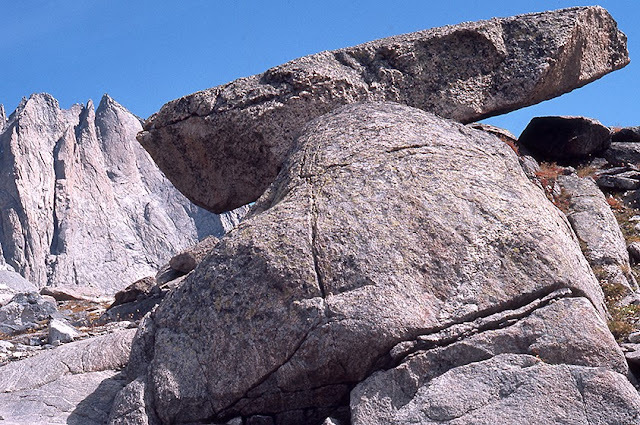 We have huge granite summits quite close to us on both sides, and our surrounding terrain is little more than rock outcrops and patches of forest. Clear Lake is supposed to be of good size, and from where we are, it is hard to imagine just where that lake might be. Wind River, #21: Following the path up onto the granite bench, we literally change our environment in a matter of minutes. 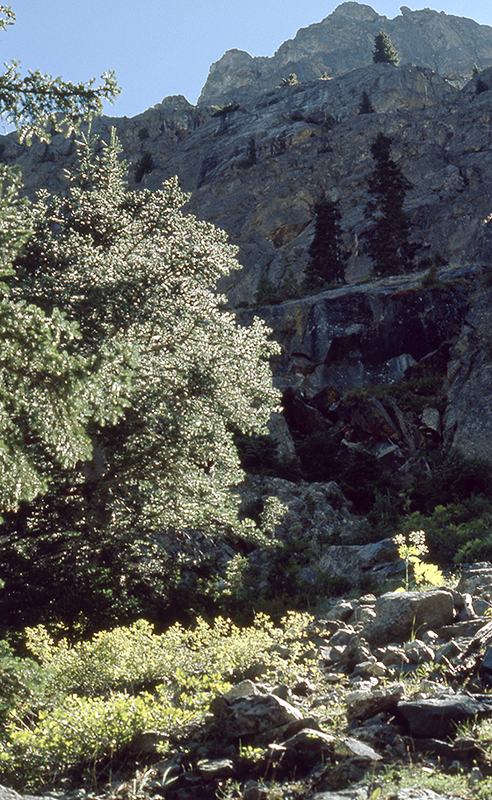 The trees do not disappear, but now they are just here-and-there, growing out of the granite boulders, and surrounded by blooming alpine meadows. 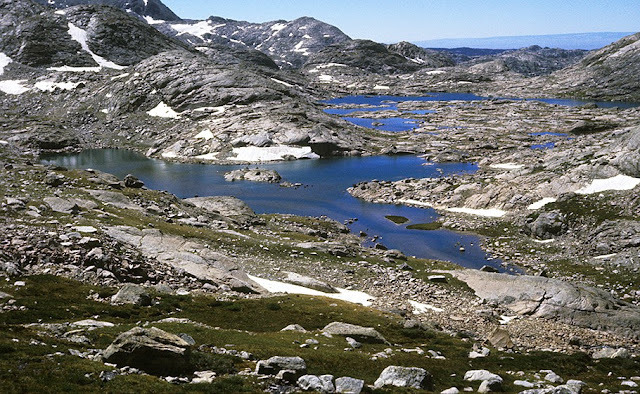 This looks like what we were hoping to find - a granite, high-alpine terrain, that hopefully offers lakes, camping, and fishing. 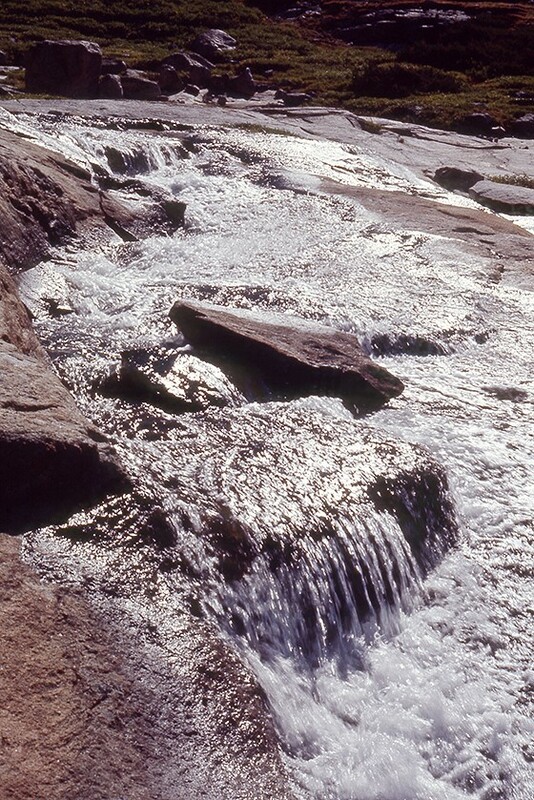 Water trickles down the surrounding rock faces in many places, and the meadows are buzzing with insects. As we stand here to take this all in, I note that everything seems oversized, bigger in dimension than other ranges in which we have hiked. In particular, it is clear that if you choose to go off trail and wander in the granite, the abrupt sheer faces of various boulders, and walls require some intelligent navigating to get around. Boy, will that idea become more clear as the day wears on. 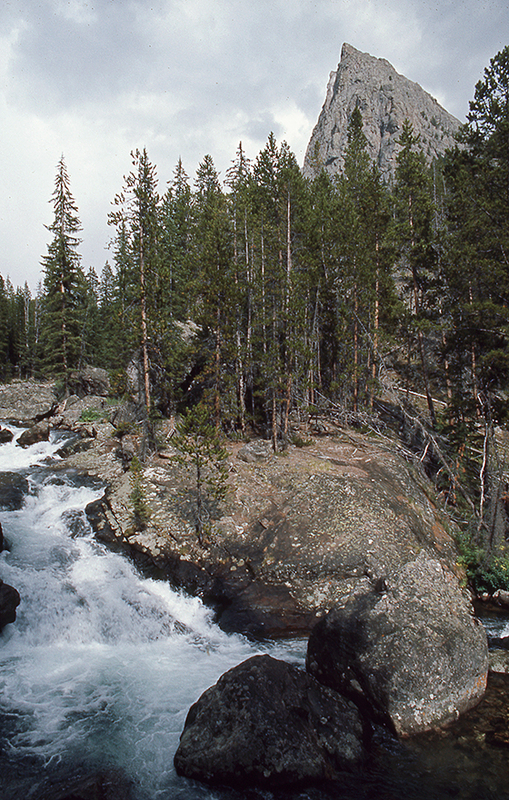 Wind River, #20: Farther along the Clear Lake Trail, it continues to ascend and the river becomes increasingly dramatic. We finally reach a point where the trees thin, and much more exposed granite defines the landscape. A rather ominous “fang” also appears on the horizon. I am not sure if it is part of Flat Top Mountain, or perhaps some adjacent peak, but it quite impressive, AND it is all granite. 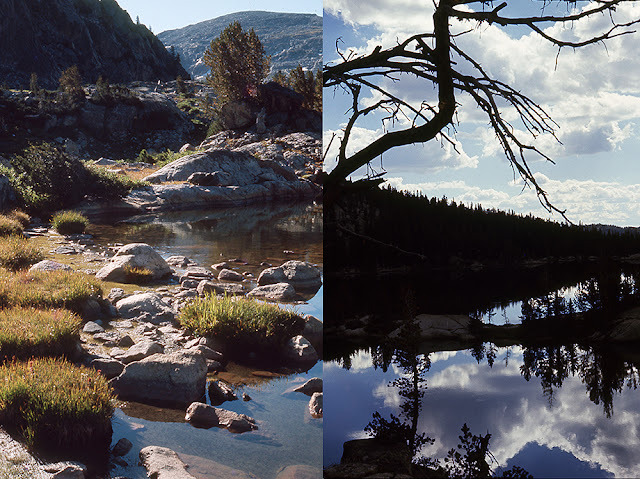 We ARE getting excited because we have been camping and hiking in Wyoming for more than two weeks now, and FINALLY we are seeing an environment that looks like the alpine terrain that we have been hoping for. For perhaps another 1/2 mile, we wander through diminishing stands of trees, and then come to a very steep part of the trail that takes us up over a large granite bench. Wind River, #19: Chris, Cathy, Belle Star, and I sleep well enough but wake extremely sobered by last evening’s storm. There is more weather rolling through today, but it is not storming, and it is warming up. After a leisurely breakfast, we agree that it “feels” safe enough to proceed up the trail without further weather worries, so we pack lunches, shoulder our day packs, and start off,..and UP. Shortly after passing out of the meadow and into the trees, the trail begins to climb, and the river begins to be noisy, as there are more cascades and pools. At the moment, we are not exactly “in” granite, but we seem to be getting closer with every step. 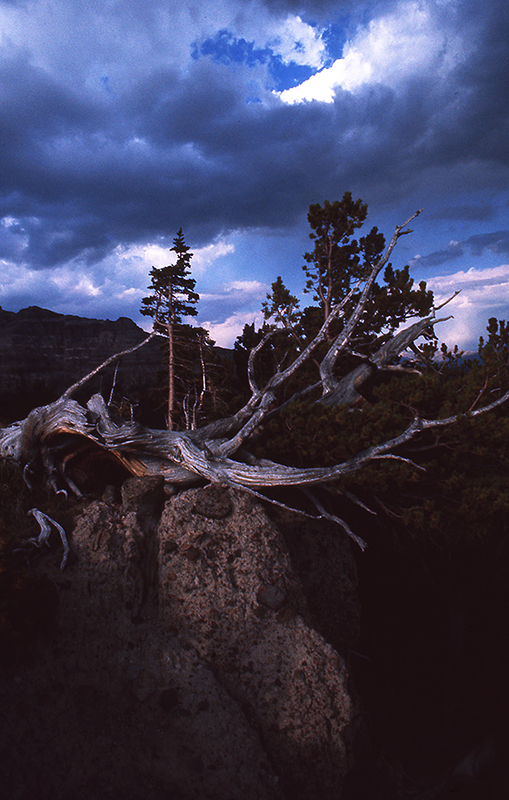 Wind River, #18: By late afternoon the weather is getting worse. Once we start up the Clear Lake trail, it opens into a very broad meadow, and the our path parallels the river coming down from Clear Lake. The meadow is bordered by trees, but there are only a few growing out in it. By the time we reach the other side of the open expanse and re-enter the forest cover, we know it will still be a good walk to reach the lake, and we are not sure if campsites can be found there, so we decide to stop where we are, have dinner before the weather gets worse, and we will daypack into Clear Lake in the morning. We set up and eat, and after dinner we are sitting on a log enjoying the low, late light that has turned the meadow golden under the dark clouds. Across from us, the steep walls of Flat Top Mountain rise up into the sky, and beyond that we can hear a lot of thunder and see the glow of lightening flashes, even though we were sitting in sunshine. Within a few startling seconds, however, all of that changes. VERY suddenly a massive dark cloud just rolls over the top of the mountain, and we can see sheets of rain working down the slope toward us. Then there is a deafening thunderclap, and lightning strikes a tree in the meadow right in front of us. My dog, Belle, goes first, but we all bolt for cover, actually abandoning our tents and gear and running into the forest of trees closer to the river. The storm rains, hails, and thrashes us with lightening so intense, I have my eyes closed, and I can still see different flashes have different colors. Then, as quickly as it came, the storm is gone. Wow! That was real! 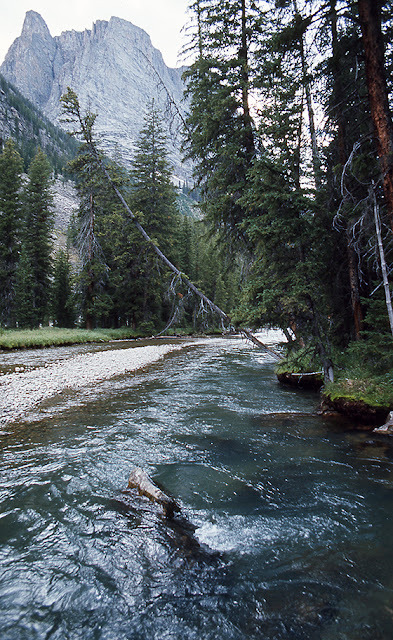 Wind River, #17: If we were lucky, our hike reached a point slightly to the left of Squaretop Mountain. We could see granite UP THERE, but it did not appear to support the “vast alpine terrain and lots of lakes” that we were hoping to find. It also seemed you would need to do technical climbing to summit. As I previously posted, naively we had come here to hike without topographic maps, so we really had no idea where anything was,..YET! The night remains warm and very buggy, so we spend the evening moving around a lot and just generally goofing, as you see Chris and Cathy doing here. That is MY hiking companion Belle Star, standing there with them. After dinner, we agree that this river valley is not exactly what we came for, so I suggest we move camp. I feel we should backtrack down-valley to the point in the trail beneath White Rock. At that juncture, trail signs indicate two other trails we have not explored, and both appear to go UP. One leads to Slide Lake and the other leads to Clear Lake. Once there, we can then chose one of those for our next camp. Chris and Cathy agree, so next morning we break camp, but by the time we are on the trail, weather is starting to roll through again. Upon reaching the place where our path begins to ascend, we stop for some lunch, and a last survey of the valley floor. Afterwards, we head for what we hope might be alpine terrain. At the base of White Rock, drawings on the trail sign indicate mileage distances to the two different lakes. 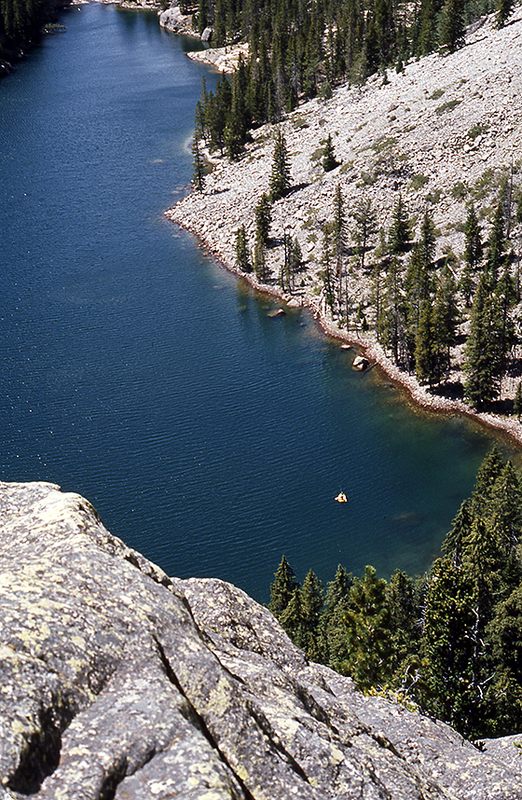 Slide Lake, the closest of the two, is up much higher and the drawing suggests the trail has a lot of switchbacks and NOT much camping terrain around the lake. Clear lake is a bit further away, but appears to be larger, and in a larger basin, so we speculate there are likely more places to camp there, and head that way. Wind River, #16: We establish a pleasant camp, the weather passes, and except for too many mosquitoes, the evening is quite nice.The next day dawns sunny and warm with no weather showing as yet, so we shoulder daypacks and continue to explore the trail we have camped near. Surely if we follow it we will eventually find the famous Wind River granite alpine terrain. We walk some miles, however, and the trail remains relatively flat, and DOWN on the valley floor. It has become much warmer, and weather is now appearing, so we stop for lunch, and Chris breaks out his rod and reel to chase those also-famous Wind River trout. At this particular moment, he is “sneaking” up on an undercut bank where something might be hiding. There are fish, and he does catch them, but none of them are trout, they are all whitefish, and Chris is VERY disappointed. After his numerous attempts, we decide it isn’t getting any better, so we retrace our path to camp, and settle in for the evening, enjoying the fact that the weather of the day never got worse. Unfortunately, the mosquitoes did not go away! Wind River, #15: After a really pleasant day atop White Rock surveying our surroundings, we wander back to our car camp at the bottom end of the lower Green River Lake. We do not have an afternoon storm, so we have a pleasant dinner with Gordon around a campfire,..and then he departs for Idaho, because he needs to be back for his job. Chris, Cathy, and I, send him off and slumber early, as we intend to backpack into the depths of the Green River Valley in the morning. The day breaks hot, with early weather coming in, so we get moving early as well. We follow the same trail from our day hike yesterday to the junction with the Clear Lake trail and the base of White Rock. Then we continue along it as it wends its way back down through the trees and onto the valley floor adjacent the end of the upper lake and the beginning of the river. It is a far more tiring hike today because we have full multi-day backpacks, and because it is hot. Hot enough to storm, and so it does. At first, the rain is refreshing, then it intensifies, and we can hear not-so-distant thunder. We are glad to be down in the valley when the storm rolls over us because the lightening is fierce and the thunder deafening. Some claps directly above us, make the ground shake. It is frightening, and we huddle in trees to ride it out. When it finally passes, we walk on a few more miles, and decide to camp at a very nice spot we find overlooking the meanders in the river. Dinner is uneventful, but we all agree, the storm was sobering, and it must have been REALLY scary if you were up higher in open granite. 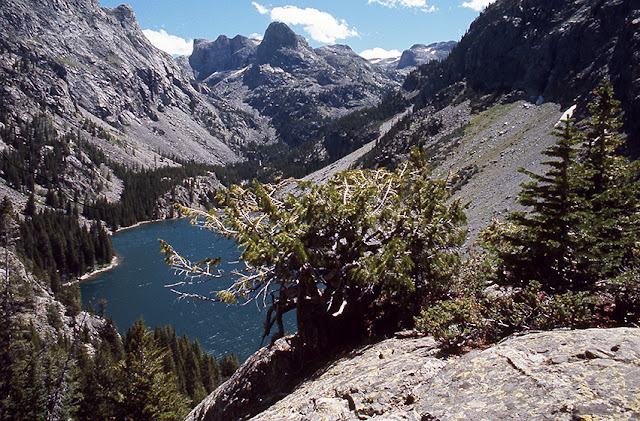 Wind River, #14: Looking off the summit of White Rock, this is the valley and upper end of the upper Green River Lake. We are car camped at the opposite end of the larger, lower lake, and from there the view is quite different (post #11). Now we can see the continuation of the river into the backcountry, and also the trail that follows, coming in from the lower right. Chris is especially excited because he wants to fish, and we have been told the lakes in these mountains host fantastic trout fishing, so this looks like the place. On a crude wooden trail map we passed along the way, I noted that there is a Clear Lake trail and also another to Slide Lake and it seemed as though we might be able to see them from up here, but we cannot. You might say, “why not look at your topo maps?”, but unfortunately, when we have backpacked in the company of our DFC&FC colleagues in Idaho, we are in the company of those who know where they are going, so we do not use maps. Now, here in the Wind Rivers, maps seem like a good idea whose time has come, but our trip has already started without them, and it is too late, and too far to go get some now. Our learning curve is going to occur in another way. Wind River, #13: Following Gordon Williams' suggestion that we try to summit White Rock for a look around, we leave the marked trail at the base of the mountain and begin a long, slow ascent through meadows and boulders. It is surprisingly easy going, but even though we are not in granite, we are at serious elevation, and we all feel the altitude and are breathing hard. We are also amazed that we are as high as we are, and we are still walking in boulder-littered meadows with flowers. 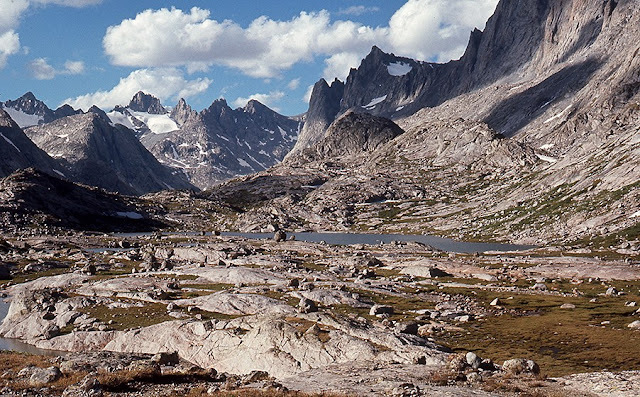 We can SEE granite spires, but none of them look particularly approachable without serious climbing, so we are still not clear about where the vast domain of granite in the Wind Rivers really is? One thing is clear, however, this is a much bigger realm to wander in than the Sawtooths or Pioneer mountains of Idaho. It is also much higher. Gordon has just discovered the views are sweeping as well. If you will look back at post #11, you will see White Rock in the spot of sunlight on the left side of the lake. Note the steep, striated walls that cascade down to the lake. Our hike today has taken us high into the trees you can see on the left, and then up the sloping backside of White Rock, where, now near the top, Gordon is looking off of the steep face, down onto the lake and valley below. Wind River, #12: The morning is crisp and cool, more like a fall day than a summer one, so we rise early, eat, pack, and are off. We decide to walk the trail on the east shore of the lake which will bring us to the foot of White Rock. From there the trail divides. It rises into the forest toward Clear Lake, and it also continues back down to the valley floor, following the river to further, smaller Green River lakes that lie beneath the distant granite spires. Our walk gives us a much better sense of the granite domain above us, and we also begin to realize how large the lakes and valley are, in which we have camped. Still, we are not IN granite, mostly forest, and it is clear to us now as the day wears on, that we are NOT going to reach any granite on this hike, so Gordon opts for the next best thing, “The Higher You Get, The Higher You Get,” the motto of the DFC&FC advises the day, and he thinks we should summit White Rock to have a better look around. Wind River, #11: In a matter of a very few miles, I change my mind about the appearance of the Wind Rivers. The road we are on draws close to the narrowing river and leaves the rolling sagebrush to enter the forest. Shortly thereafter, we encounter the Green River Lakes campground, which is half-empty, so we secure a nice spot, weather a passing thundershower, and decide to take a walkabout. We have yet to explore where we are, so there is quite a bit of squacking when the campground trail to the lakeshore reveals this. We are looking across the largest of the Green River lakes, and the sloping, sunlit summit to the left is White Rock - while it IS rock, it is NOT granite, BUT the profile of the angular summit in the shadows to the right, Squaretop Mountain, is definitely ALL granite. It seems to us that we are indeed at an entrance to that world, but as yet we have some elevation to gain before we are actually IN it. Our DFC&FC friend from Idaho, Gordon Williams, arrives before dark, so we dine, enjoy the evening, and retire at a respectable hour, because we plan to do an all-day hike on one of the lake trails in the morning. Wind River, #10: Chris, Cathy, and I, leave DuBois and head for the west side of the Wind River Range, where most of the trail access to the high country of granite is to be found. 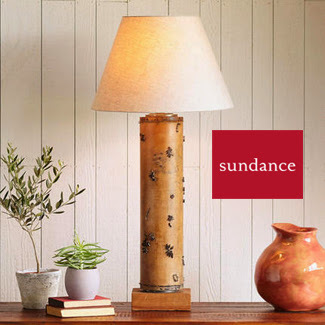 Our drive takes us, past the Tetons, and through Jackson Hole, south through the Hoback Valley, and up, onto the high plains at the western foot of the range, to the small town of Pinedale. We would eventually learn that many hikers/climbers come here and stay for a few days to acclimatize before going higher into the Winds. For us, however, this is a gas and grocery stop. The closest trailhead is Elkhart Park, just above Pinedale, but it is the most-used access point, and offers no car camping, so we are going to drive up, into the Upper Green River Valley, and approach the peaks from the Green River Lakes campground, where we are also hoping to meet Gordon Williams, our DFC&FC colleague from Idaho. Most of the road we take is dirt, following the Upper Green River Basin back into headwater streams. We see a lot of rolling, sagebrush covered hills, an occasional antelope, and a cow or two. As was my impression of the Wind Rivers from the east side, my first view of the range from this side is also underwhelming - MOSTLY BECAUSE I HAVE NO IDEA WHAT I AM LOOKING AT! I can see a peak-less, alpine terrain with some snow, but where are the 14 tallest summits in the state, the 40 summits above 13,000ft, and the ferocious climbing walls with exotic names? What I DON’T understand yet, is the vast scale of this alpine terrain, and what I DON’T process is that it is snow-covered in August! Our weather is pleasant for the drive, but as with most afternoons since we have been in Wyoming, there is a daily build-up of heat and clouds, usually ending with some hours, or minutes, of passing thunderstorms, and that pattern appears to be progressing as we get closer to the campground. 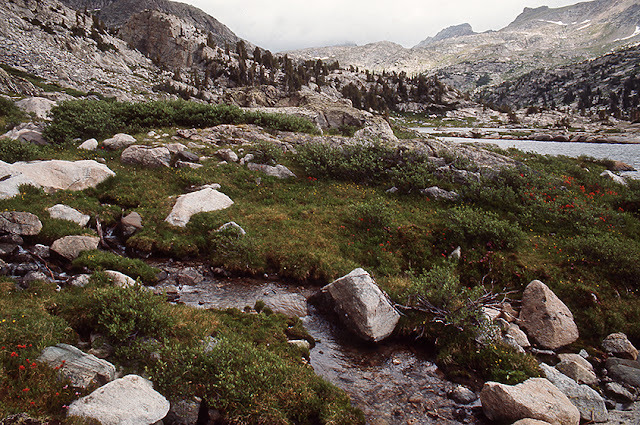 Wind River, #9: Not quite sure exactly where the actual Ramshorn is, we scramble up really steep meadows of small flowers and tiny grasses to emerge here. As it turns out, we are on Ramshorn Peak, but NOT the actual Ramshorn, which you can see, poking up at the sky in the middle of this picture. These are truly strange mountains as this image reveals: the faces of these summits look like a layer cake, that we now know to be composed of conglomerate boulders and compressed mud; the backsides are not even mountains, they are 11,000ft meadows - and not a solid rock face to be seen anywhere. Our weather holds. 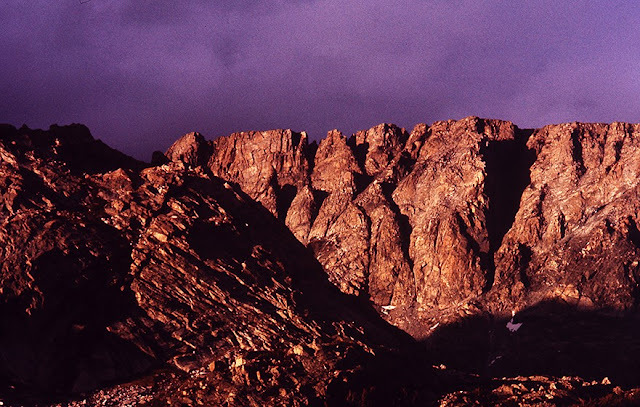 We have a cool, dramatic-sky day with a stunning view of the Badlands, the Du Noir Valley, and to the west, the sloping shoulders of the Wind River Range. Our walk down, is a stroll, we have a beautiful evening in camp with a 3-D, full color sunset, but no storm. All is good. No badgers! We sleep well, wake to a warming day, pack up, and head down. The hike is hot, summer has returned, and buy the time we reach the car, the afternoon build-up to thunderstorms has begun. We dump our gear in the car, and race down to the highway to get off the grease-mud before the rain starts. The first burst comes with major lightening nearby, literally making the weird formations of the Badlands glow, then the road gets REALLY slippery, and we slither our way the last 1/2-mile to the paved highway and safety. By the time we reach the ranch house at the Diamond-D, the storm is over, and the sun is returning. We, on the other hand, are NOT going back into the Du Noir. 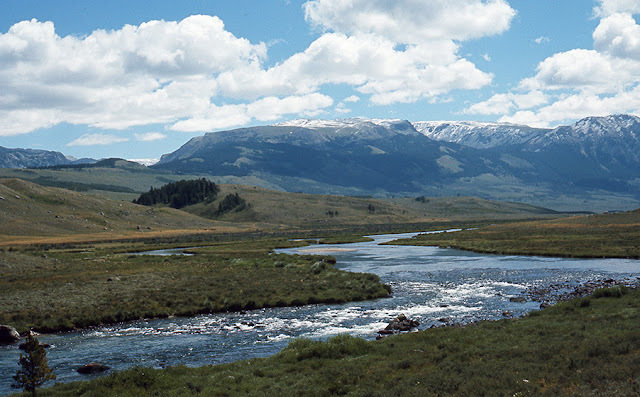 Our plan is to access the Wind Rivers through one of, what are know to be, their “popular” (read easy) entrances, the Upper Green River Valley and Pinedale. The Upper Green River has a campground that is supposedly quite beautiful and dramatic, with numerous trails, AND it is portal to the GRANITE domain of the Wind Rivers. We also call Gordon Williams, our DFC&FC friend from Sun Valley, ID, and tell him he should join us at the campground. He agrees, and thus we all set out for the Upper Green River Lake campground. Wind River, #8: The morning dawns cool and breezy, and we wake to the sound of the wind blowing through the stands of trees. Weather is pouring over us in the form of small, puffy cumulus clouds, but they are NOT building up, they are blowing through - at least at the moment. It feels like a fall day, more than a summer one, and we all agree to proceed with our plans. 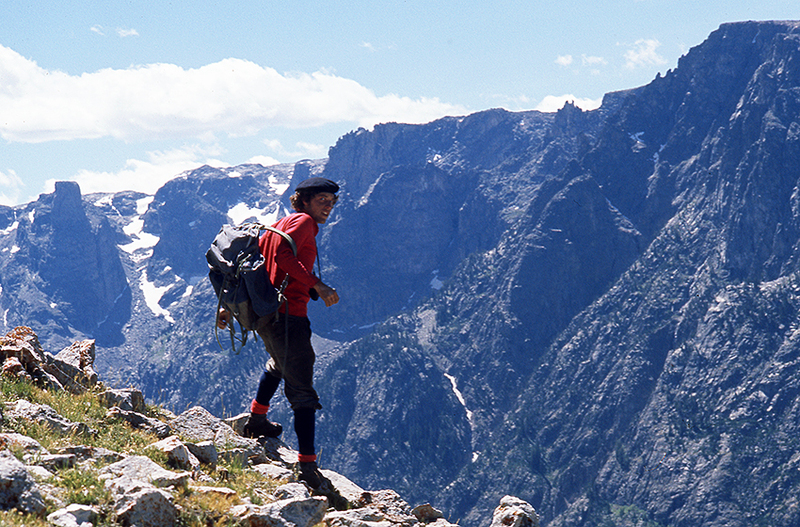 Breakfast, daypacks and cameras, out on to the trail, and into Ramshorn Basin. The “basin” begins as another expansive pitch of meadows with tree stands, but it rises more steeply. The constant breeze increases as we ascend, and then becomes wind storm, as the tree stands sheltering us somewhat, cease, and our walk continues through a big, broad meadow that is totally exposed. These meadows are not as lush or as tall with flowers as those where we have been, but they are still completely covered with tiny alpine blooms that are hugging the ground, and staying out of the cold breeze as much as possible. At the head of the basin, we find numerous snow patches left from the previous winter, even though we are in the heat of August. The terrain is very spare, but quite weirdly garden-like with flowers popping up anywhere there is supportive soil. 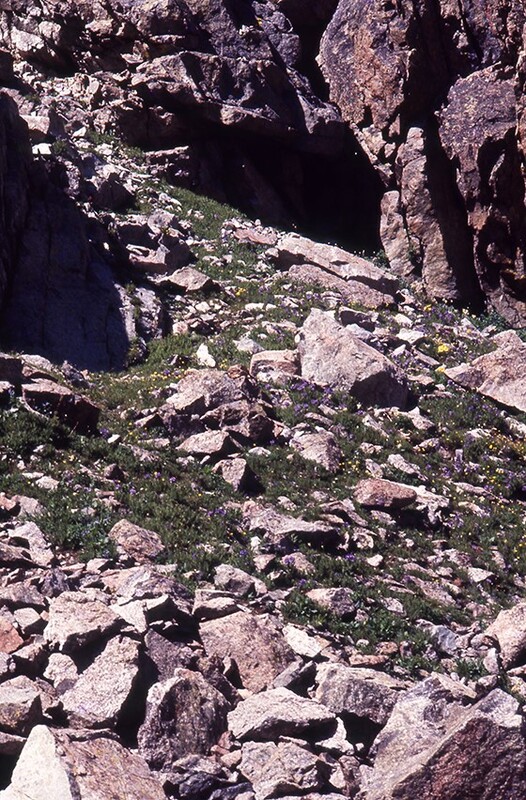 To us, strangely, summiting is a meadow walk-up, with the only rock we encounter being the rubble where no meadows are growing. Note also that it is hard to tell from here which of these is the actual Ramshorn. 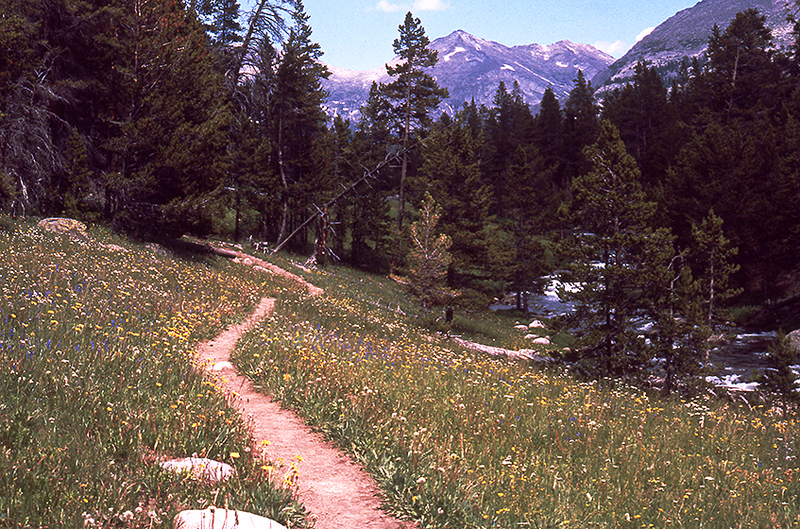 Wind River, #7: Our path leads us through several broad meadows filled with flowers, that are punctuated by stands of trees. The expansive terrain at this elevation is really surprising to us, as it was invisible from below, and although we are “alpine” at about 9,000ft. by all description, this does not look like the alpine we know from hiking in granite mountains. Were these alpine meadows and lakes as we knew them from adventures in Idaho ( dfc7fc), we would be surrounded by rock at this point, the lake would be jewel-like, set in that rocky terrain, and the “meadows” would be small and intimate, in many places only supporting space for a single tent. Right now it feels to us like we are still walking in the the trees and meadows of the forest floor, that is now several thousand feet below us. AND, where is the lake? Then the trail rounds a bend, and this appears. 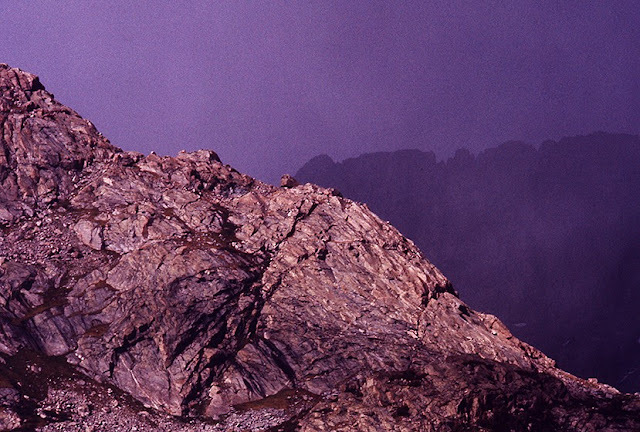 With room to camp an army almost anywhere, we pick a nice viewpoint of these summits, and settle in. The trail goes on past our site, so after we set up and square away camp, we return to it to see where it leads. In this image, we have come in from the left, and the continuing trail goes to the right, through that spot of sunlight on the other side of this POV. What we discover is that it winds around BEHIND the cliff faces that form the front of the range and lie before us here. We ARE at the heart of it all, for sure, as we hoped to summit, and preferably Ramshorn Peak, 11,800ft.. What we do not expect is the trail takes us to Ramshorn Basin, where we can approach these mountains from their backside. Knowing the basin is our ascent point, we scramble in the nearby crumbling ledges for the remaining afternoon, gaining some treeless elevation so we can watch the afternoon storm build over the Du Noir Valley. With weather past, we descend and head back to camp for the evening. Enroute along the trail, we encounter (at a good safe distance) a MONSTER badger prowling around, so after dinner we have a new food storage protocol involving really tall trees, then - sunset, star show, lights out! Tomorrow, weather permitting, we will take in new views and breathe a much thinner part of the atmosphere at 11,000+. 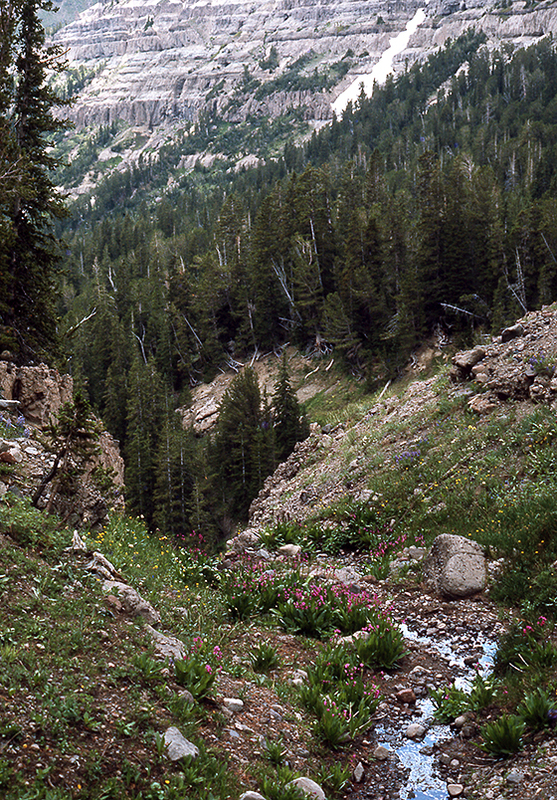 Wind River, #6: Our hike through the trees brings us right to the base of the steep, layered walls, and then the trail runs along them for awhile, until it comes to a stream tumbling down a verdant and flower-filled ravine of boulder rubble. Turning rather steeply up the ravine, our trail ascends through a scree of small rocks, and bridges various rock band layers as it climbs. Progress is slow because the rubble makes traction difficult. We get some rain as we slog upward, but nothing that makes life miserable. Although these are NOT the kind of mountains we expected to hike in, they are strangely beautiful at the peak of their summer bloom. As quickly as our ascent began, it ends, leveling off once again into a broad meadow of grass and more flowers. It is clear we have risen considerably higher, and all of us can tell we are exercising at 7,000ft. or more, because we work harder to breathe, and stop more often to catch our breath. What surprises me now, is how expansive this new meadow is. From below, none of us had any sense that there were pockets of terrain this size, so far up the slopes of these strangely configured mountains. Wind River, #5: Our trailhead/car corral does not seem very alpine to us. The path wanders off through a broad flat basin filled with flowers and grasses, and hardly seems to climb at all. This particular trail supposedly goes to a “high” lake affording access to several summits, but from where we are, it is still unclear where that lake might be. The afternoon weather has started to roll through, but the day is quite hot, so we are not really concerned if it rains, and we walk on. We finally enter some forest and draw closer to the sheer faces of the cliffs. When I put on my telephoto to study them, I see how truly odd they are. This is NOT big granite. These mountains look like layers of hardened mud and conglomerate rock that poke weirdly shaped spires skyward, like goofy sand drip-castles that you make at the beach. According to an occasional trail sign, we are not far from the lake of our intended destination, and it is several thousand feet higher, but I am still skeptical because it sure does not look like there is any place for an alpine lake in the image to the right. Wind River, #4: Weather over the Du Noir Valley and Dubois has included thunderstorms and rain every day in the late afternoon. Bill Lund has warned us not to be on the backroads of the badlands (previous post) if they are wet because they become “grease-mud,” so Chris, Kathy, and I, get an early start on our first backpacking adventure in Wyoming. The dirt track we follow winds through the desert-like badlands, past colorful mud mounds, and across occasional washes that clearly fill with flash floods when it storms. Then the road begins to rise, and our view changes dramatically. What was not visible from our previous position in the valley, were the foothills beneath the ridge of peaks we hoped to summit. View of them had been blocked by the badlands, but now that we are here, the scale of things is much larger, and there is an entire forested woodland we must still work though before we arrive at the trailhead. I think all three of us are taken aback by this unanticipated change, but the meadows that are around us now are filled with flowers, there are streams everywhere, and although the afternoon weather has arrived, we are no longer on “grease-mud”, so we forge ahead. We continue to wind through relatively lush woodlands, and finally come to a “car corral” that marks the starting point of the trail. Wind River, #2: Bill Lund, Sharon Disney, and their extended family and friends are all happy to see me when I arrive at the front porch of their Diamond-D Ranch near Dubois, WY. I have a lot of gear, and they have a lot of family, so it is mutually agreed that I will sleep, and spread out, in one of the cowboy bunkhouses that is not being used at the moment. Over the next few days, I explore the area, sometimes riding around the property on horseback with Bill. One evening, on one such ride, this view offers me a much greater sense of where I am. I am looking east, out over the Du Noir valley and into the colorful, desert-like formations I passed driving in. I can now see that they are the foothills of taller summits that Bill says are part of the Du Noir Wilderness Area, and that especially pointy peak is Ramshorn, the tallest in the range (11,800ft.) He also refers to the desert foothills as the “badlands,” and warns that if I go exploring the roads in them with my van, I will need get back to the highway if it starts rain, because the dirt turns to grease mud, “and you will simply slide off into a ditch.” Those formations ARE, literally, mud mounds melting down. 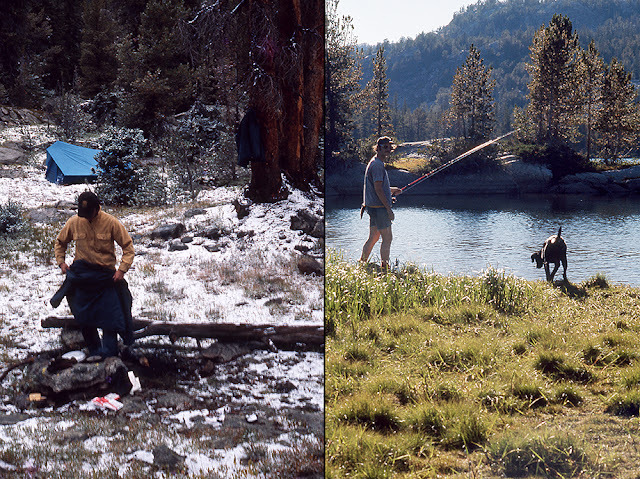 Wind River, #1: I receive my MFA from CalArts in 1974, at a time when Bill Lund, the husband of one of the school’s founders, Sharon Disney, is serving as the school’s President. My graduate show attracts a lot of attention from him and the board of trustees, and Bill and Sharon invite me to visit them during the coming summer at the Diamond-D, a large ranch they own, outside of Dubois, WY. The ranch lies in the Du Noir River valley on the eastern slope of the Wind River Range, a very tall part of The Continental Divide. In climbing lore I know the range has a lot of granite, with famous faces and specific summits, that bear some unusual names: The Cirque of Towers; Pingora; Wolf’s Head; Haystack Mountain; Warbonnet, AND it has more than 40 of the tallest peaks in WY, although most people mistakenly think those are The Grand Tetons. I have hiked and camped in Yellowstone and the Tetons, but I have never seen the Wind Rivers, so I am not exactly sure what to expect. Hoping to have some company, I ask my Decker Flats Climbing and Frisbee Club friends in nearby Sun Valley, ID, to consider joining me, and I extend the same invitation to my friend, Chris Korody, who in previous summers, has been one of the teachers in the photography workshop program, I have helped to found at the Sun Valley Creative Arts Center. For reasons of employment, no one from the DFC&FC can join at the moment, but Chris has a blossoming relationship with Kathy Schleussner, a girl who lives next door to my family home in LA, and he and she offer to come. Driving to the Dubois highway junction from Sun Valley gives me a view of the Tetons to the west, and the Gros Ventre to the south, but I cannot see what are supposed to be the sky-piercing summits of the Wind Rivers. 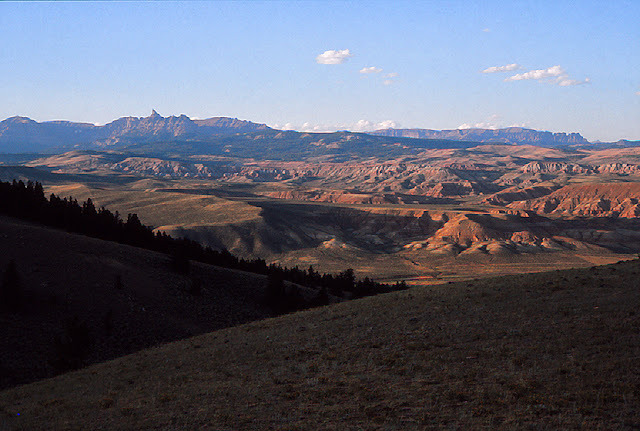 The road to Dubois then passes over a low divide and begins to descend into a broad valley with evergreen forests and big pastures on one side, and a strangely colorful desert that looks like mounds of mud melting down, on the other.